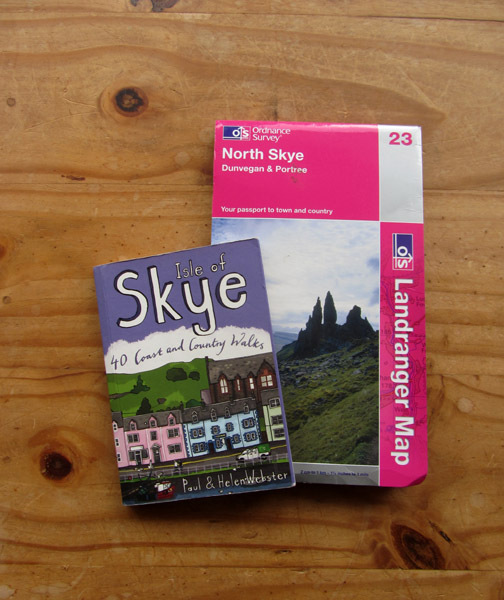 " Skye 7. 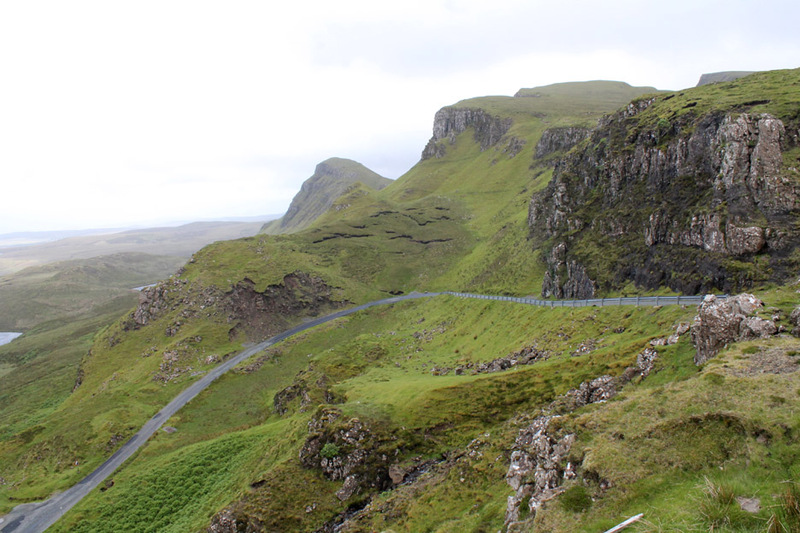 ~ Carbost and Trotternish Peninsular "
Date & Time: Wednesday / Thursday 3rd / 4th July 2013. 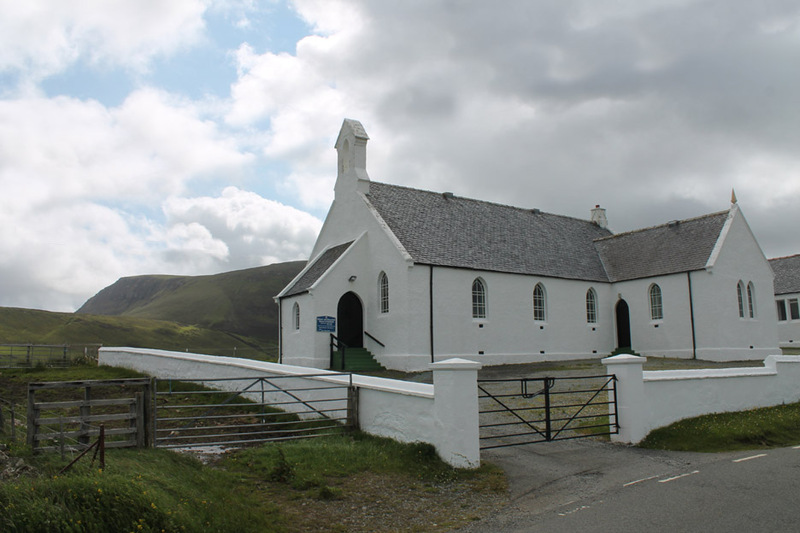 Locations : Scotland ~ Isle of Skye ~ Carbost, Portree. 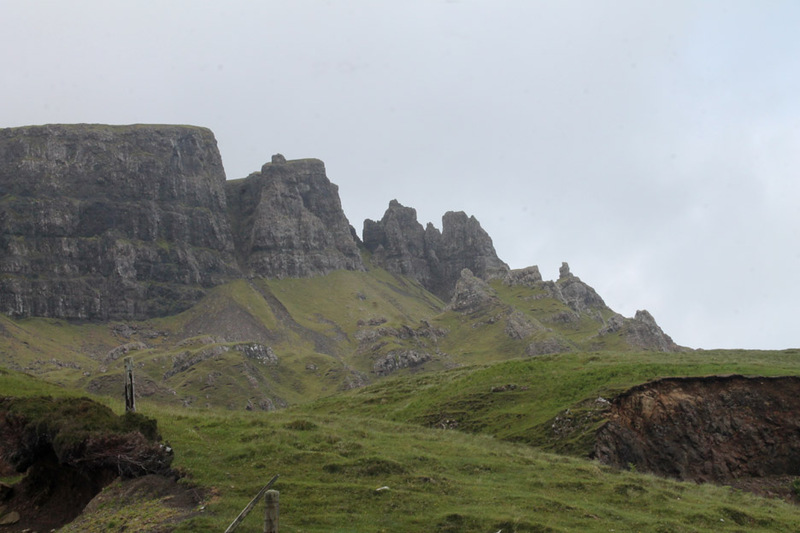 Places visited : Old Man of Storr, Uig, Quiraing, Staffin, Brothers Point. 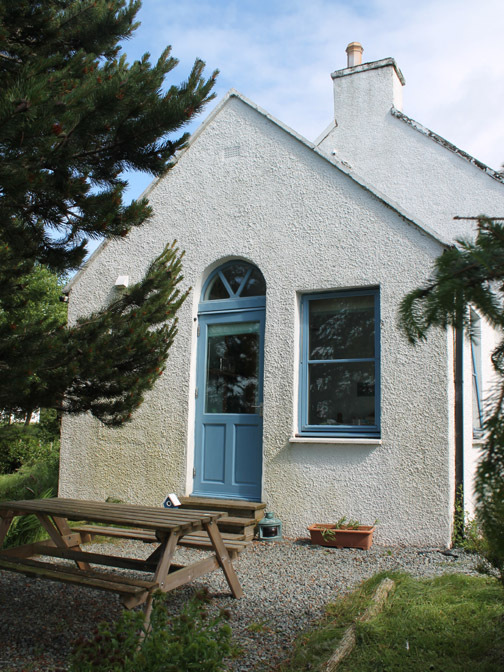 Accommodation : The Old Croft House, Carbost, near Portree. With : Ann and the dogs, Harry and Bethan. Weather : Sunshine and showers ~ that means variable and unpredictable. 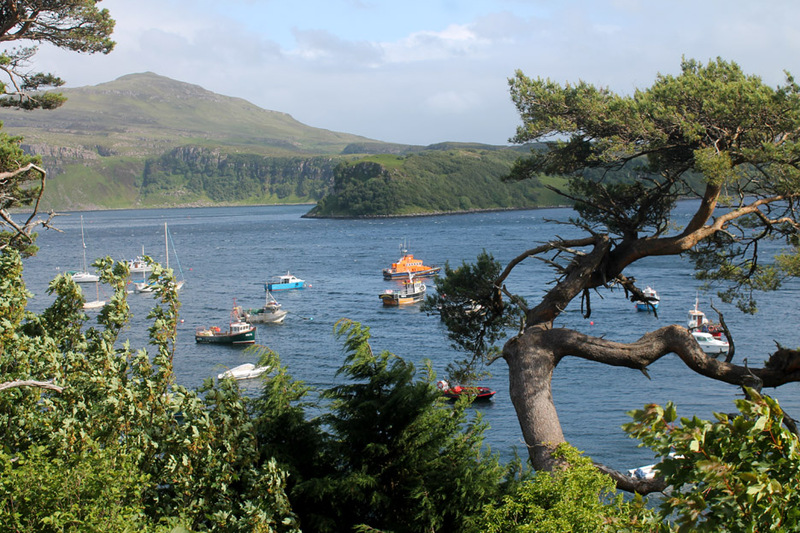 Famous for its rock scenery, the ferry to the Hebrides and the town of Portree which is the capital of the island. 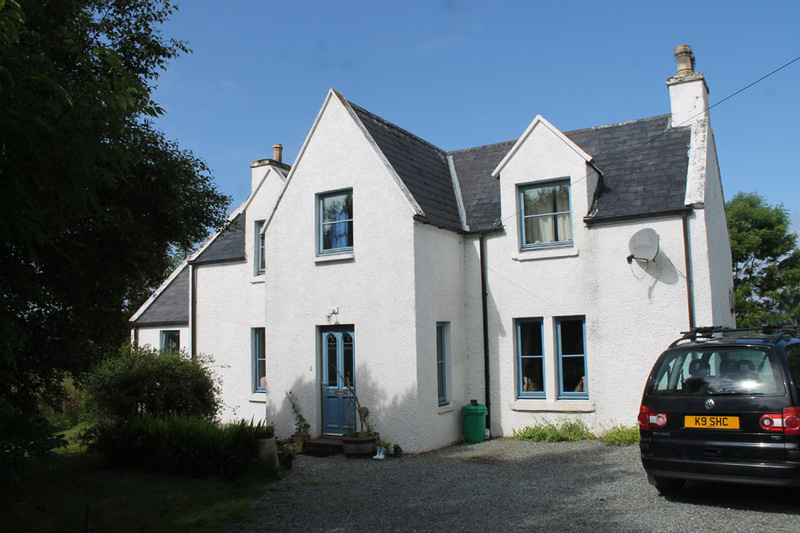 First find the B&B which for us was the Old Craft House in Carbost, about five miles out of town. 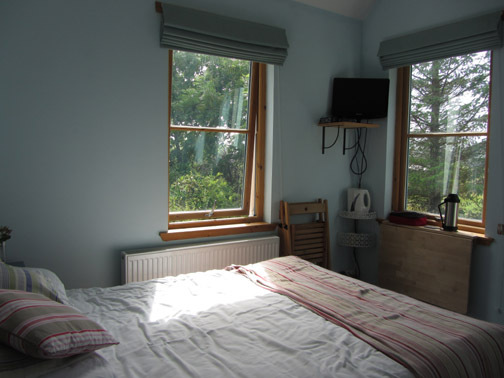 Sam and Mark live in the main house and the room on the left hand end is our accommodation. Our own entrance and access to the garden. 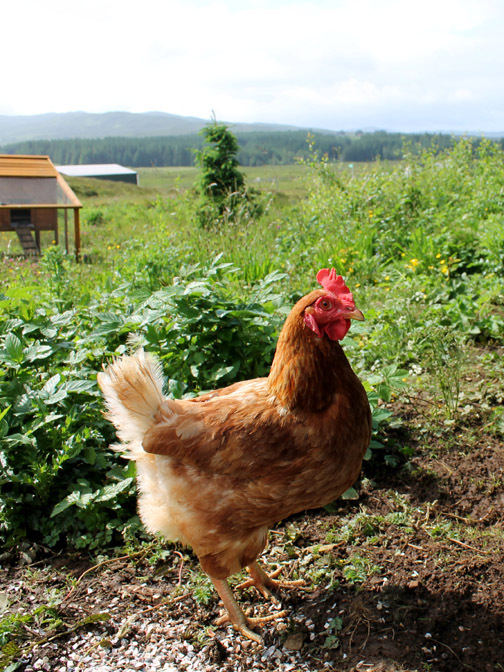 One of Sam's free range chickens. Sam makes the most amazing breakfasts and no-one, not even the ardent carnivore, would be disappointed with her superb vegetarian cooking. 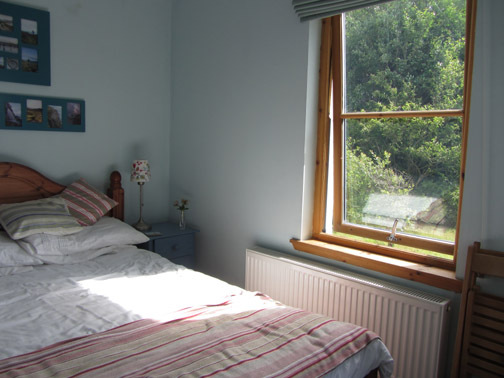 The large en-suite is out of picture behind the camera. Our bedroom doubled up as our breakfast room. The first evening the sun shone beautifully and we drove the short distance into town for a look around. 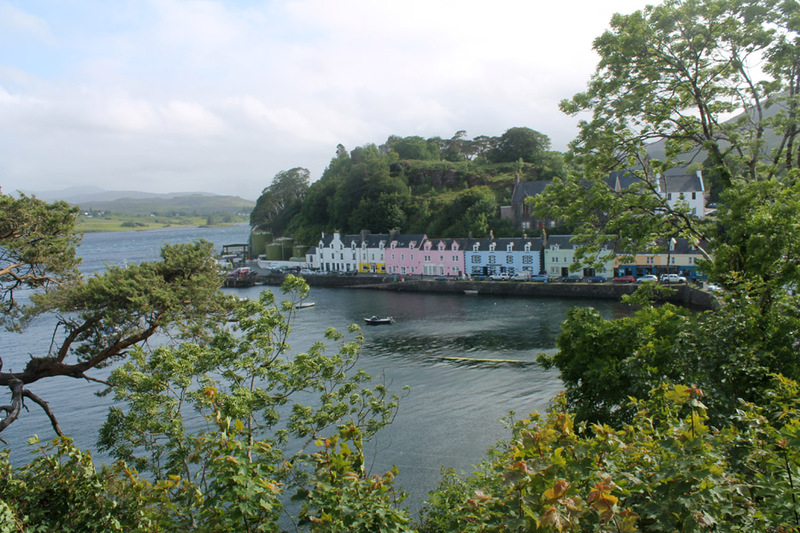 The classic multi-coloured houses that line the quay side at Portree. 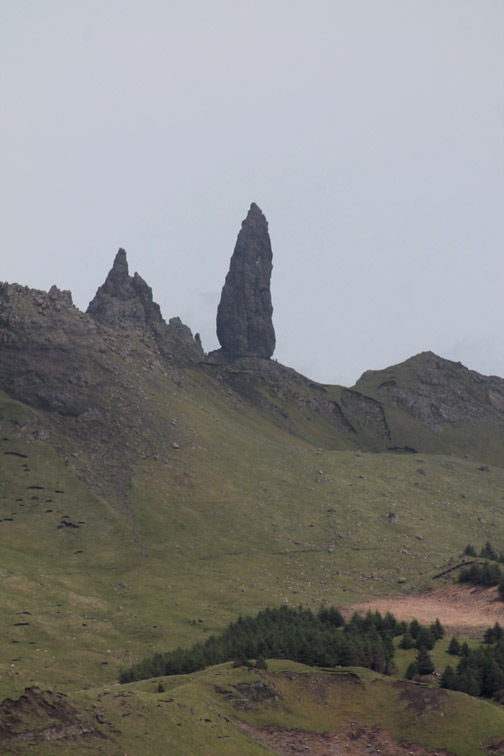 Just six miles north of Portree is the famous Old Man of Storr . 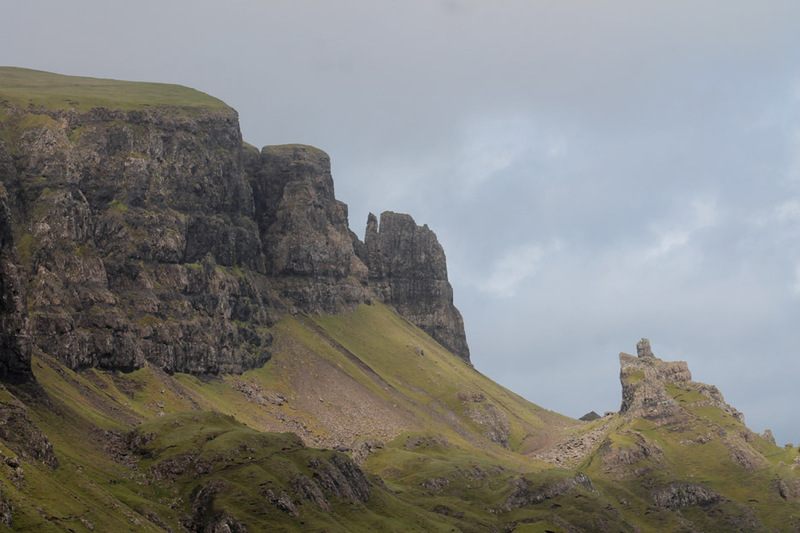 . .
a dramatic rock pinnacle set amongst several amazing rock structures on the Trotternish escarpment. The sunshine is not quite as bright as in the brochures . . . but there it is . 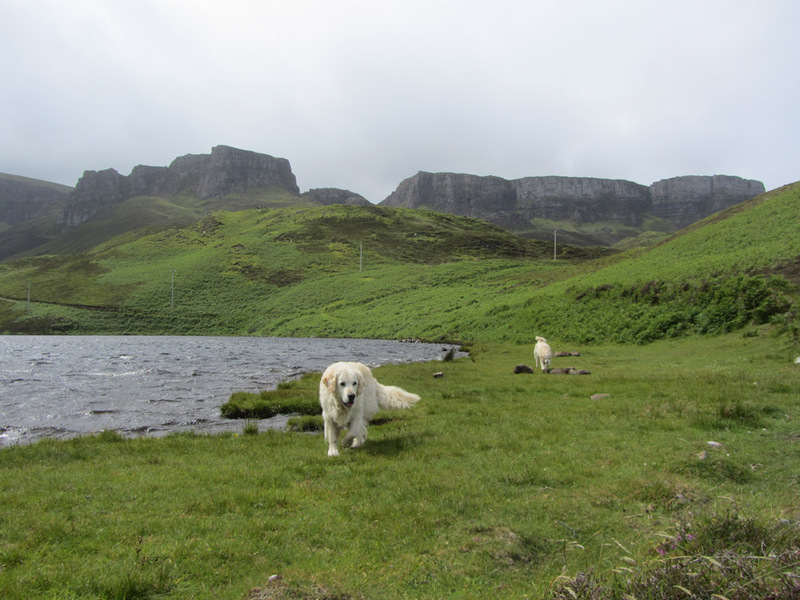 . . in front is Loch Leathan completing the picture. Zooming in on the dramatic needle of rock. The scale can be measured by the walker at its base. From the car park it rather blends with the cliff behind. 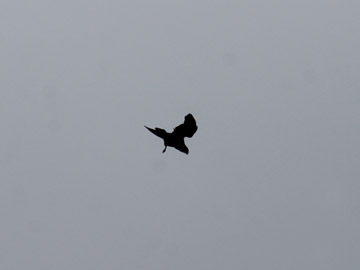 In fact without the benefit of the zoom lens it is difficult to see in this slightly grey weather. Hold your cursor over the picture to give yourself that extra clue. Unfortunately the landscape didn't match the brochure either . . . they had just clear-felled most of the trees and made a real mess. The classic walk up through the trees was criss-crossed by bulldozer tracks, muddy and almost completely ruined. 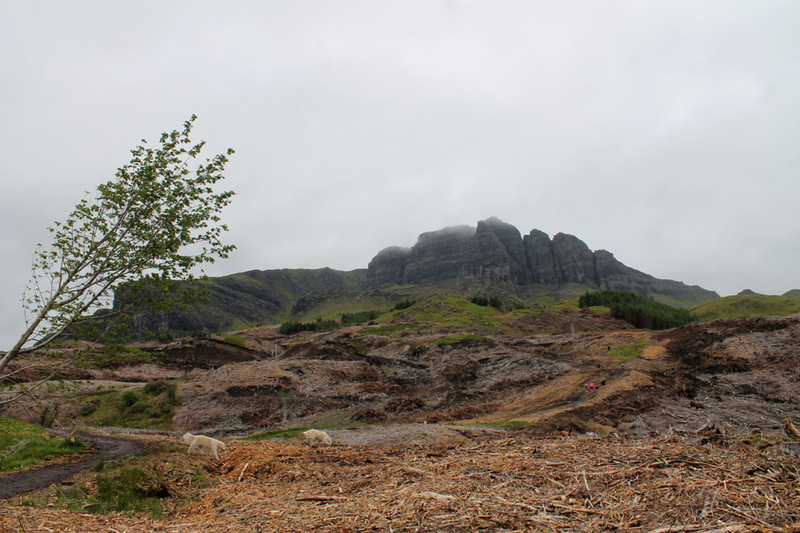 It would have seemed prudent to us that the area should have been covered by a major tree preservation order for the benefit of the tourism industry. Still the walk back down was better . 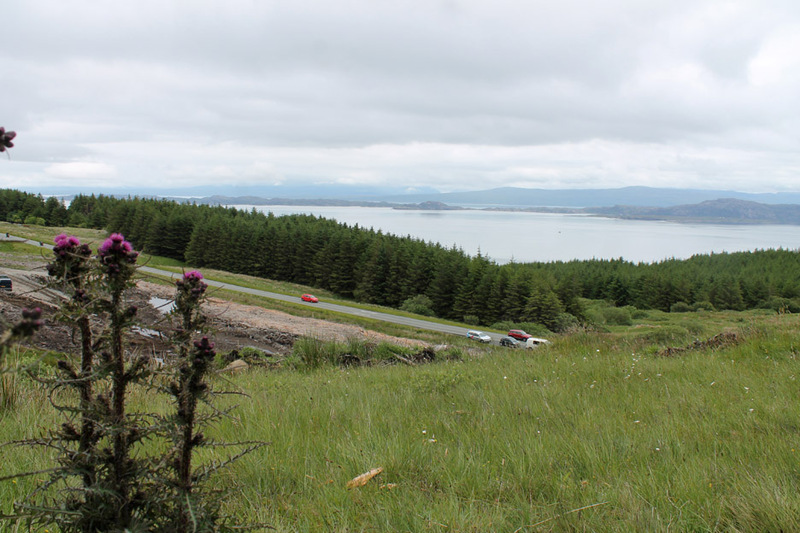 . . with views across to the Isle of Raasay and the Scottish mainland. 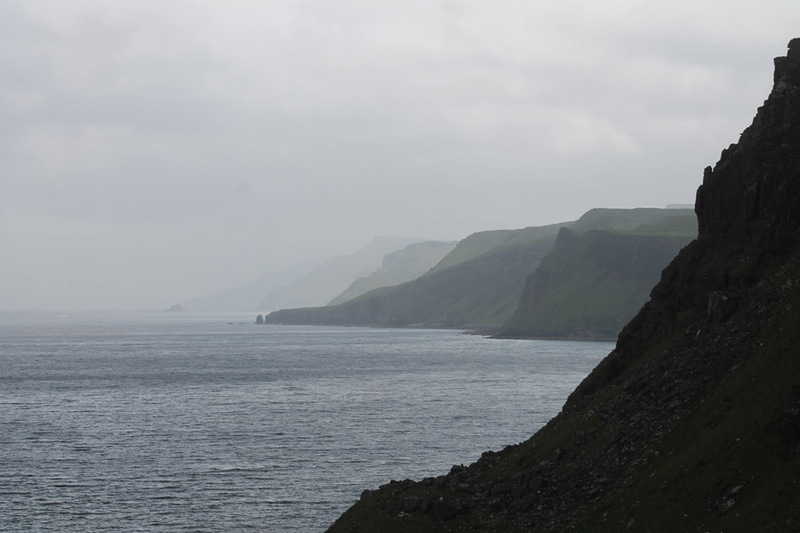 The following morning we embarked on a tour of the peninsular . . . 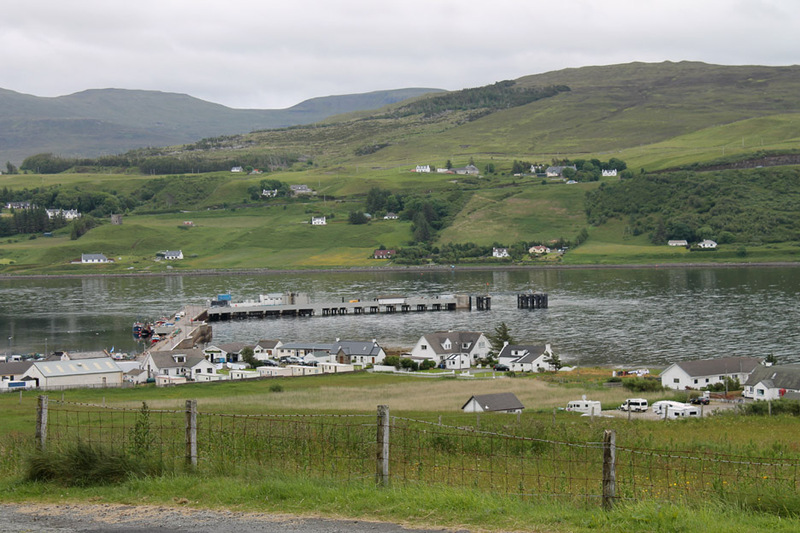 The small township and Hebridean port of Uig from The Folly which you pass on the way into the town. 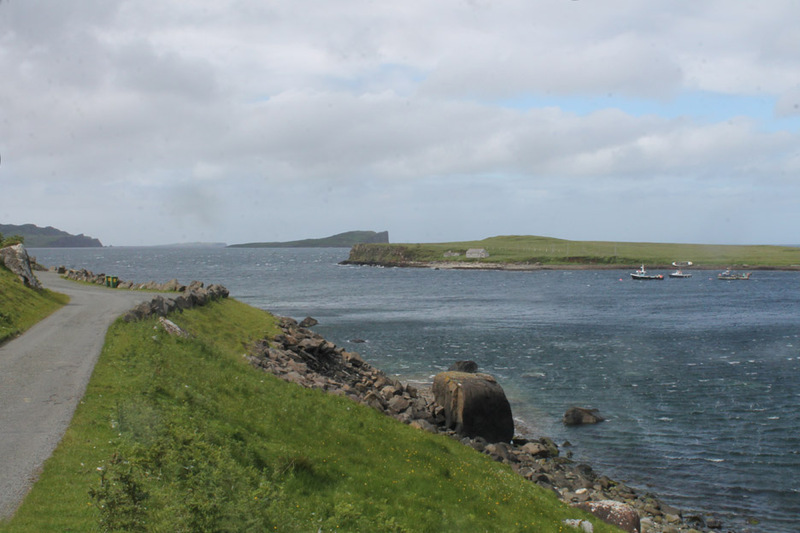 The long jetty is used for the daily crossing of the Macbraynes ferry to the Outer Hebrides. 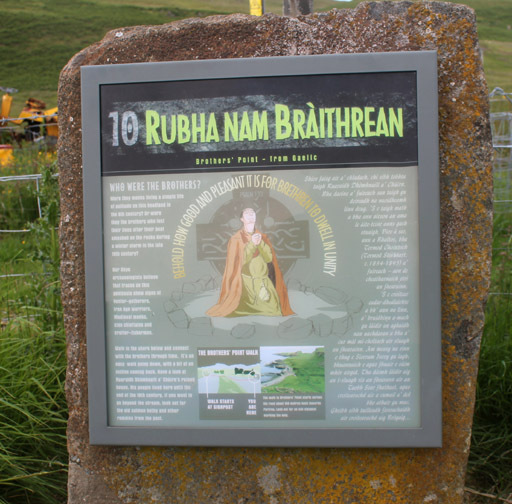 The web link lists lots of local information if you have a moment spare. 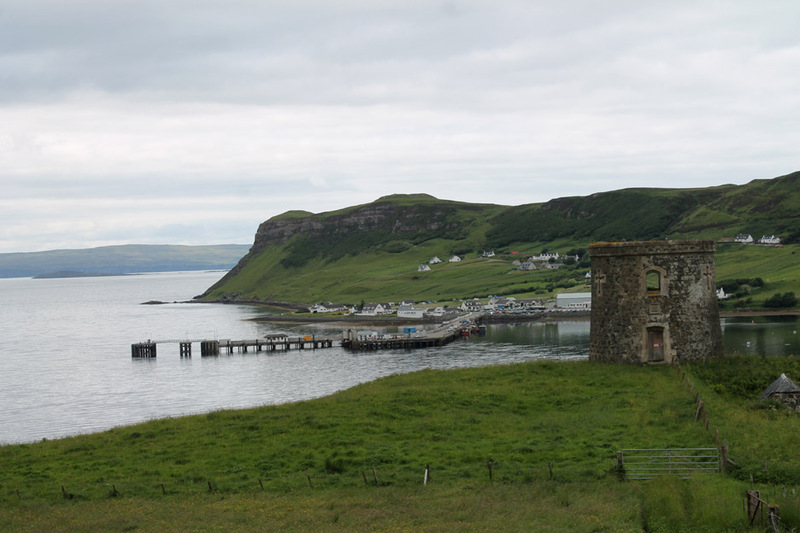 Uig Jetty from the other side of the bay. 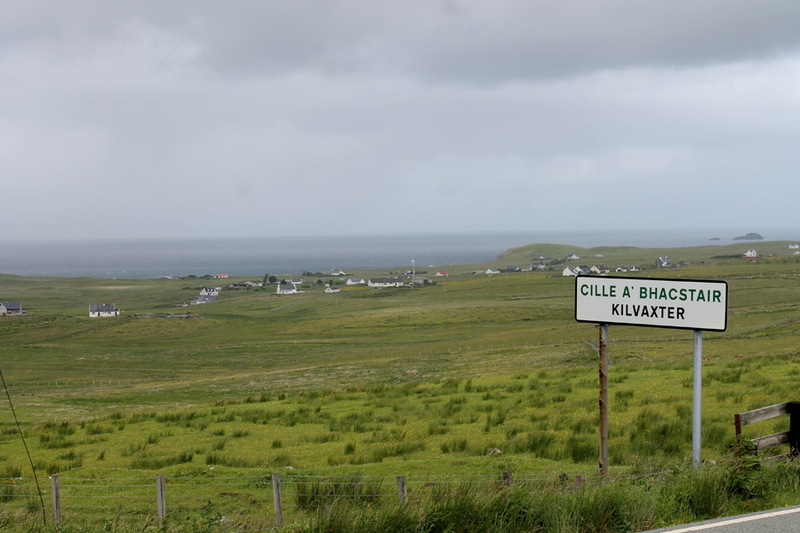 Travelling north we pass through the old crofting areas of Kilvaxter and Kilmuir. Kilvaxter Church . 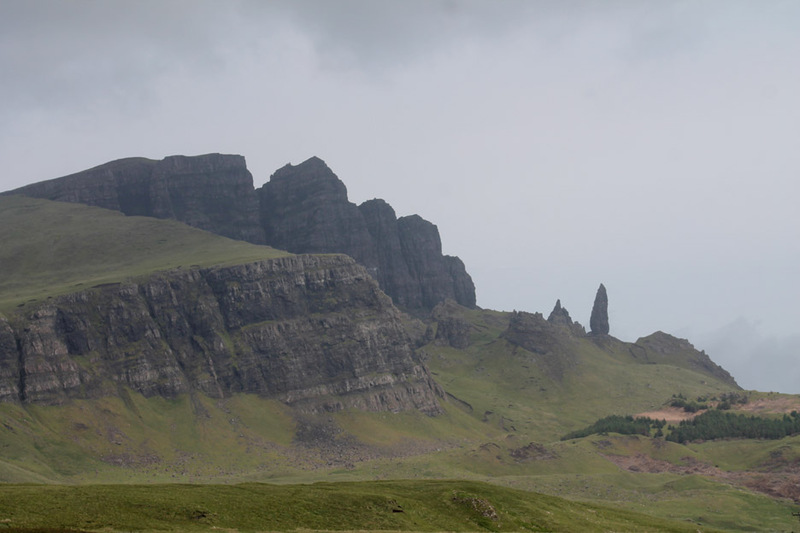 . . with a first hint of the Trotternish hills and escarpment behind. 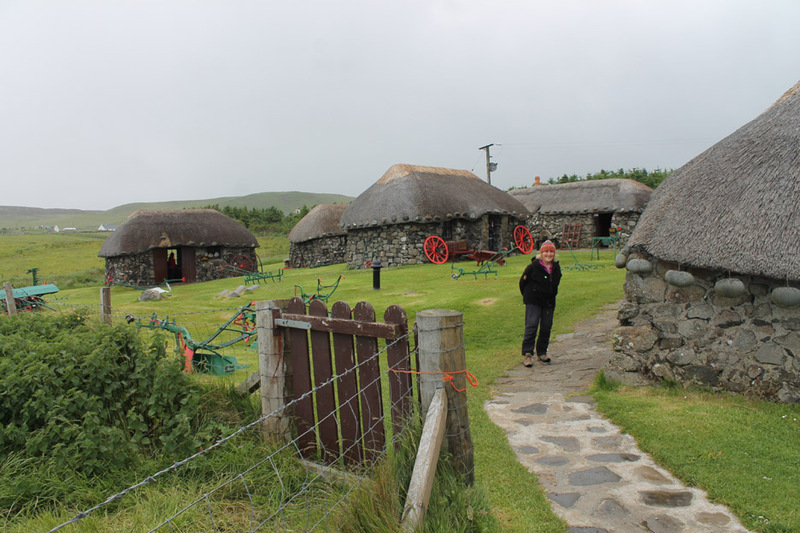 and the Museum of Highland Life created around and within an impressive display of old thatched croft houses in the village. 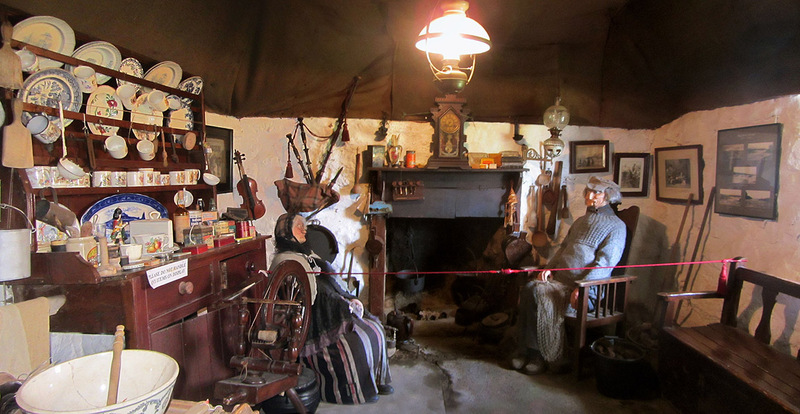 The Weaver's Cottage . . . one of many comprehensive displays. 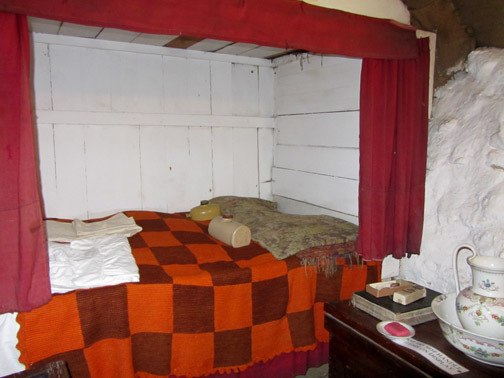 An old fashioned box-bed designed to cut out draughts. 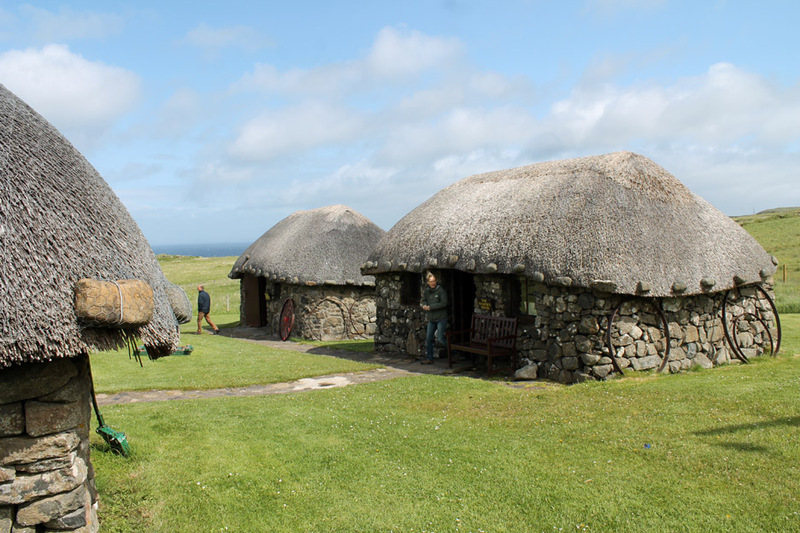 Note the stones on the eaves . 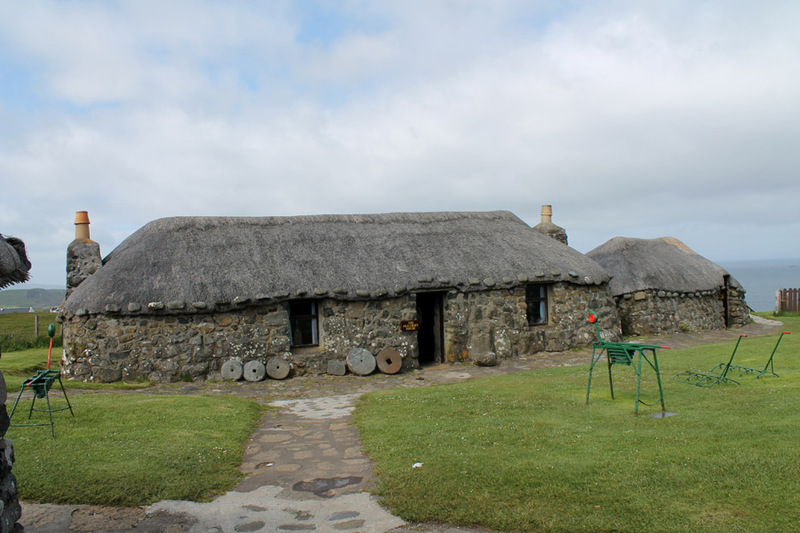 . . designed to hold down the netting that protects the thatch from high winds. 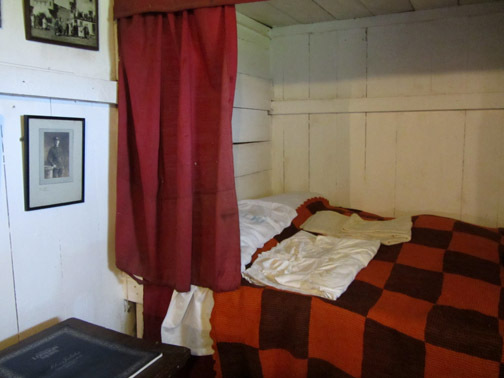 Other bedrooms have curtains instead of wood. 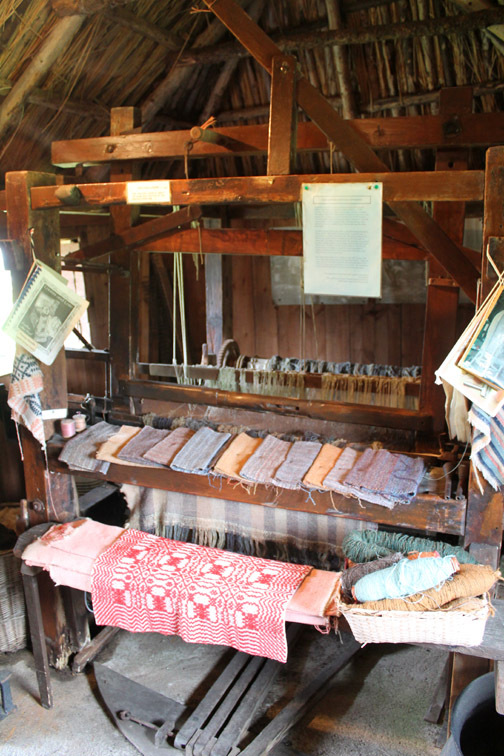 A foot-operated loom for making cloth from the local wool. A study in pastel colours . 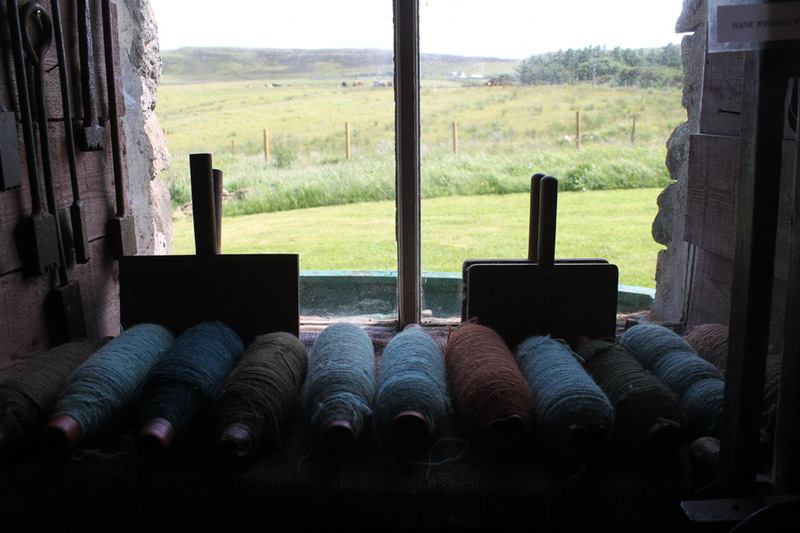 . . dyes would have been made from plants, flowers and lichens. 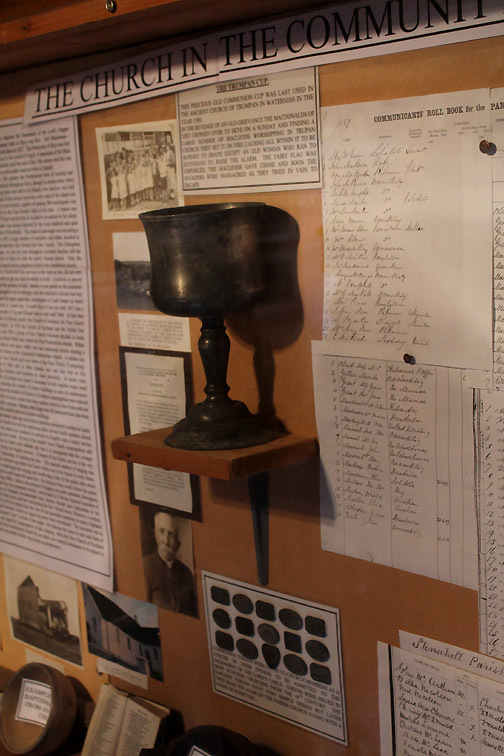 The museum is full of well preserved artifacts. 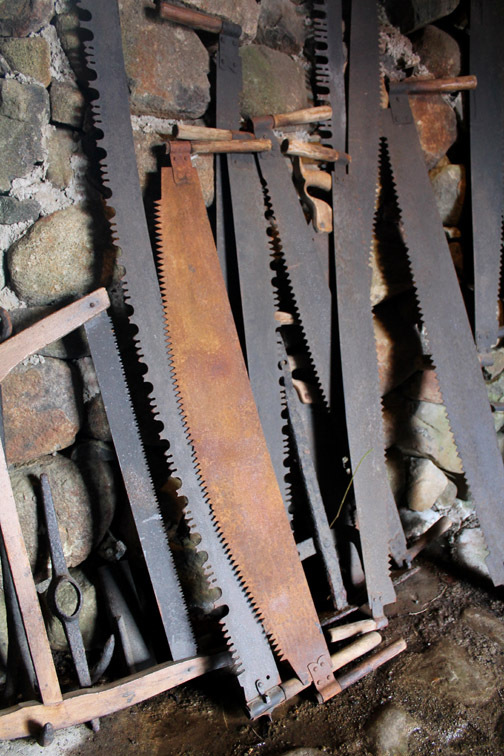 A selection of old hand saws. 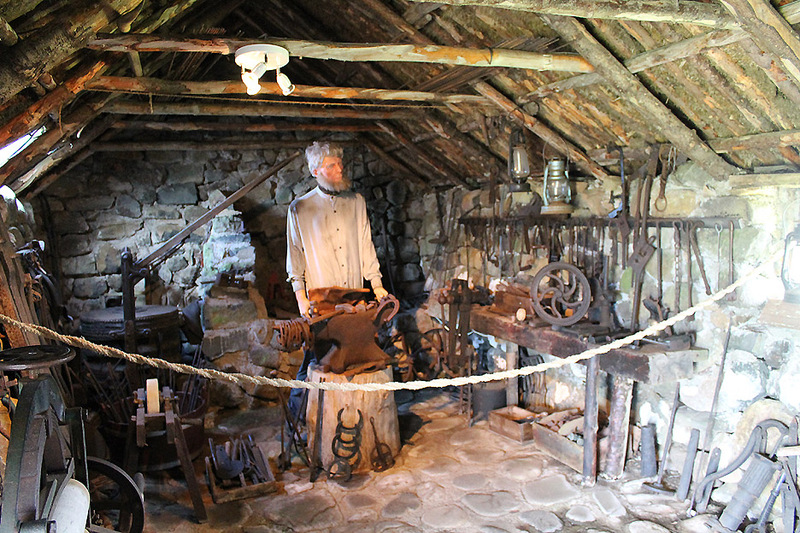 The Blacksmith's Cottage with his fireplace, anvil and a large array of tools. 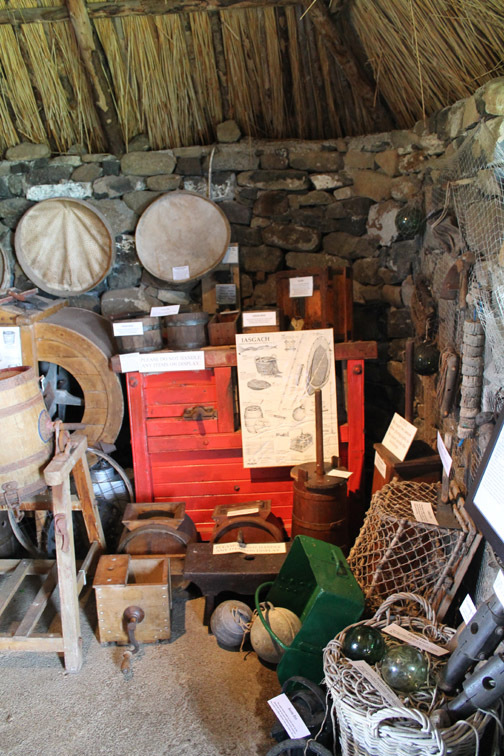 There were many old farm implements to see too. As selection of . . . I'm sure you can read it as well as I can ! 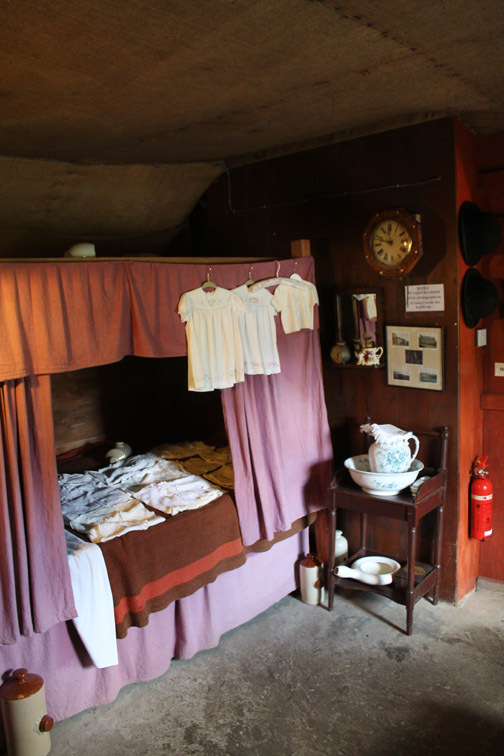 In several of the lower cottages there were extensive displays and plenty to read. Old postcards and photos . 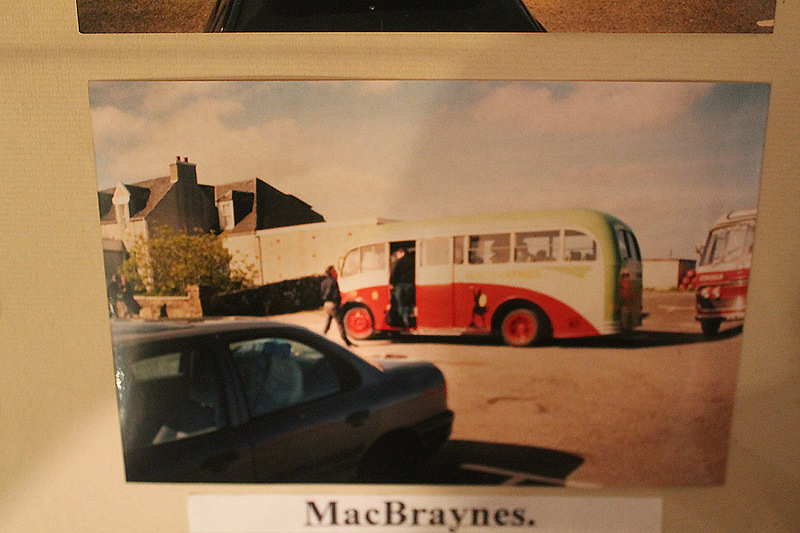 . . a classic MacBraynes bus with the Highland logo on the side. 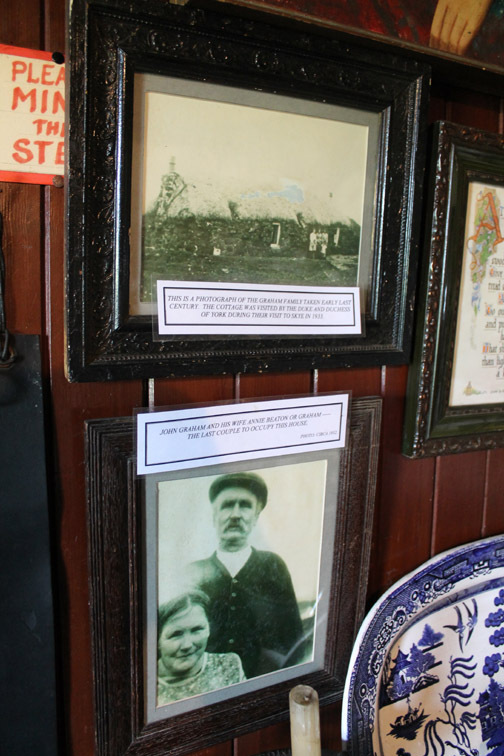 Plenty of history about local characters . . .
. . . and their activities. and more modern history of the local wartime activities. 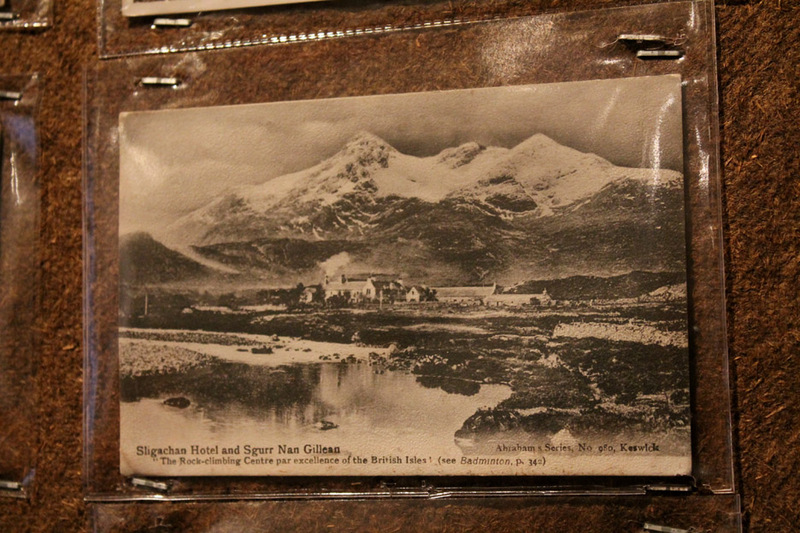 Skye transport and industry over the ages was heavily featured in this comprehensive museum. Finally an extensive collection of old postcards . 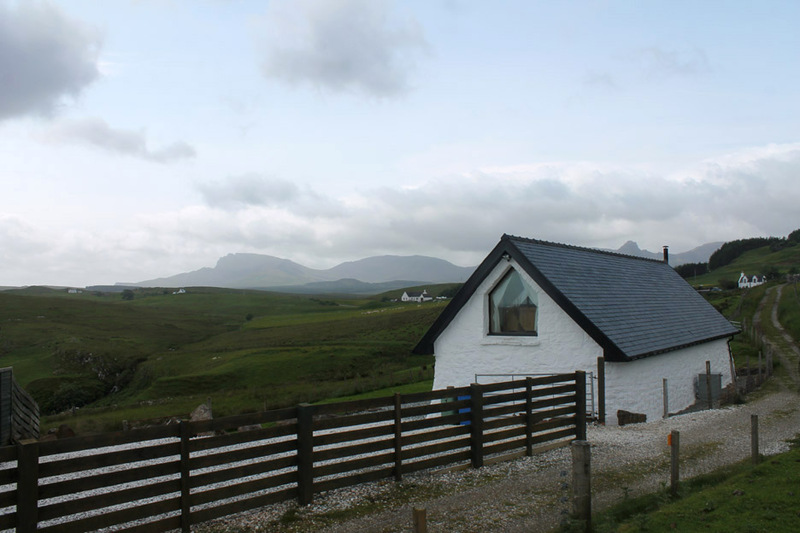 . . this one of the Sligachan Hotel, a place we had dined at earlier in the holiday. Those with a keen eye will recognise the photographers . . . 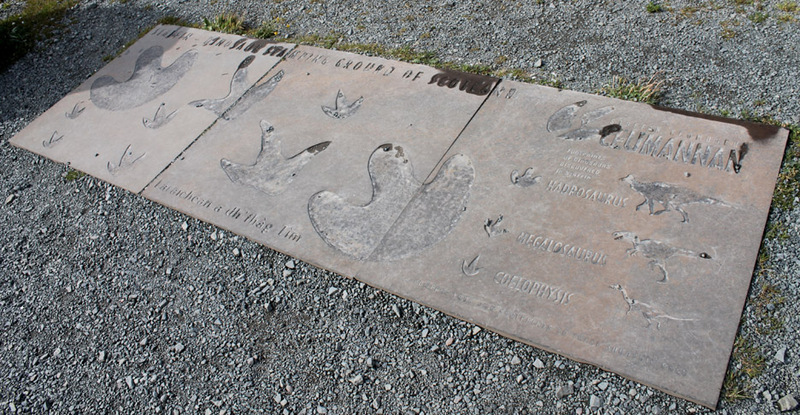 The Abraham Brothers of Keswick. 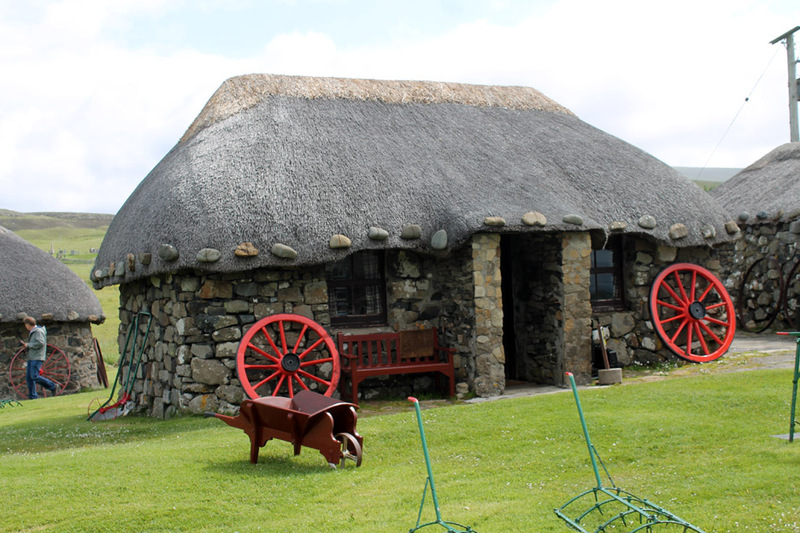 If you on holiday in the area remember to include this Museum of Highland Life in your itinerary. Moving on and nearing the top of the peninsular . 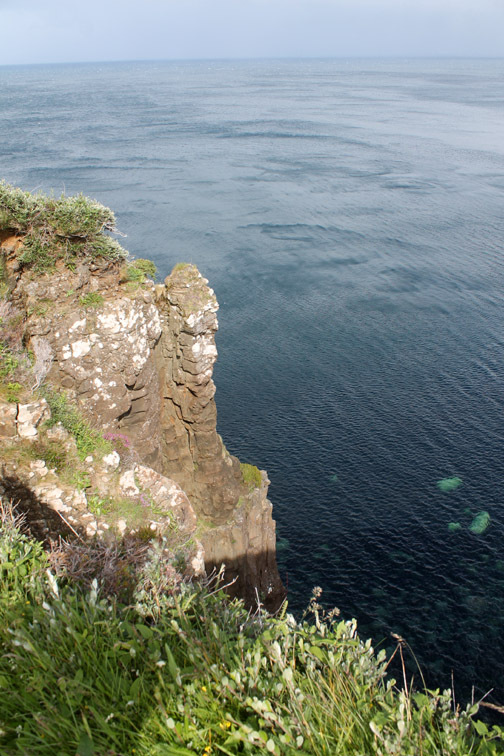 . . passing the impressive roadside cliffs near Port Duntulm. 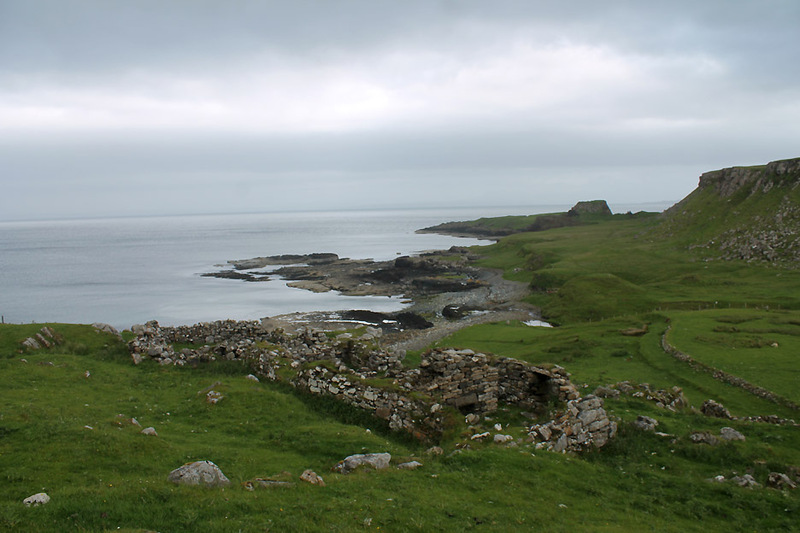 The remains of Duntulm Castle are on the headland to the left . . . the modern hotel to the right. To the top of the island and remember to turn right . 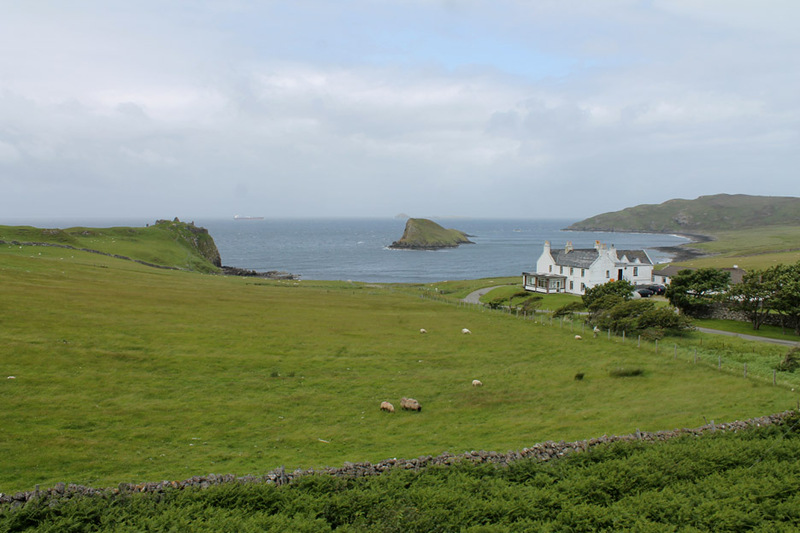 . . the road continues on past the houses of Balmacqueen and Kilmaluag Bay. 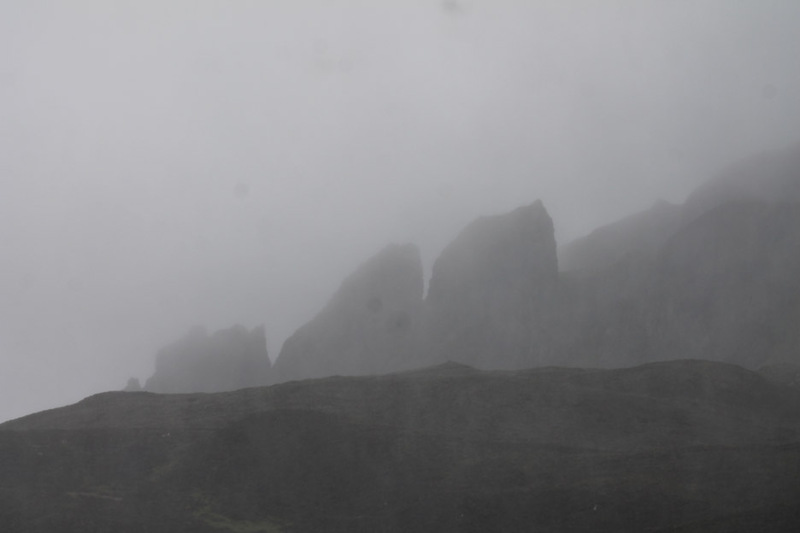 The escarpment of the Quiraing is starting to appear. Flodigarry . . . looking north east now over the open sea. 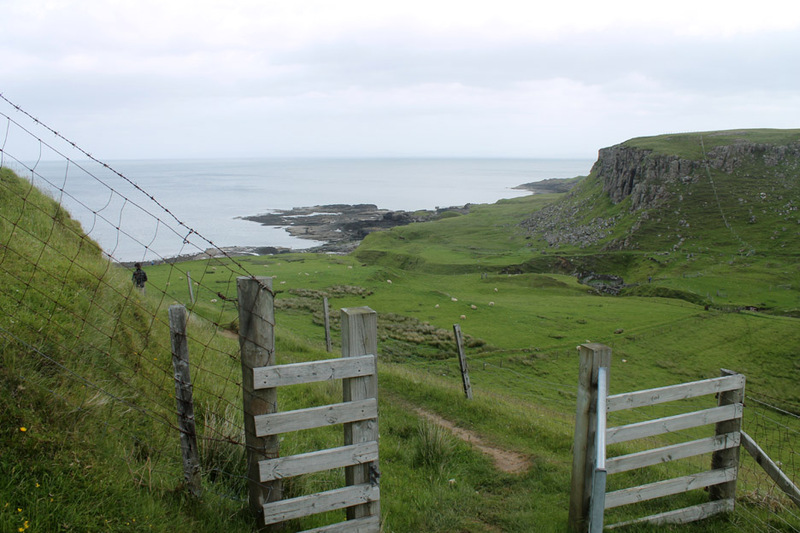 North (but lost in the distance) are the Hebrides and east are the mainland headlands around Loch Gairloch and Loch Torridon. 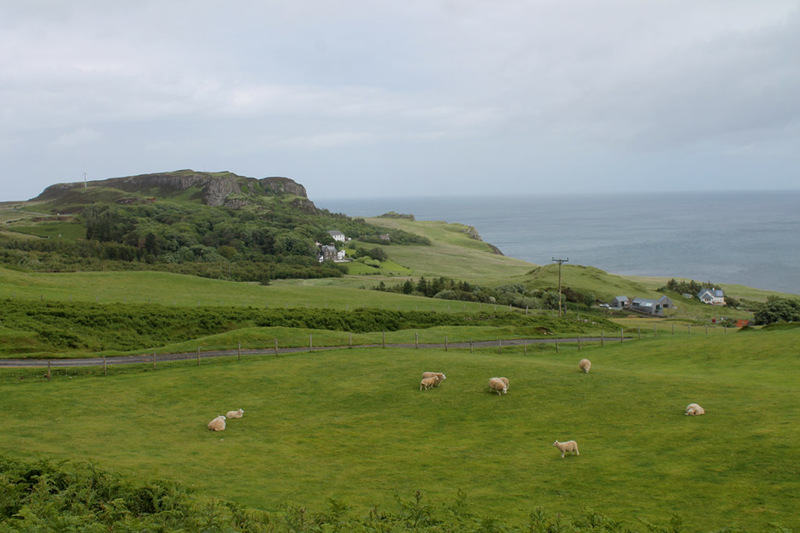 This is Staffin Bay, the road and the hillside dotted with old crofts, a large proportion of which have been modernised. which has got to be a throw back to the old croft system. Time to stretch our legs and explore a little. 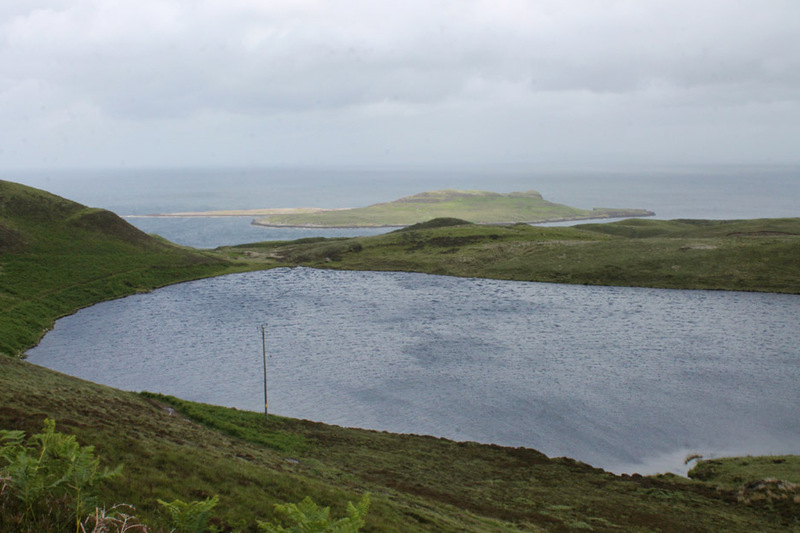 This is Loch Langaig just off the road, south of Flodigarry. 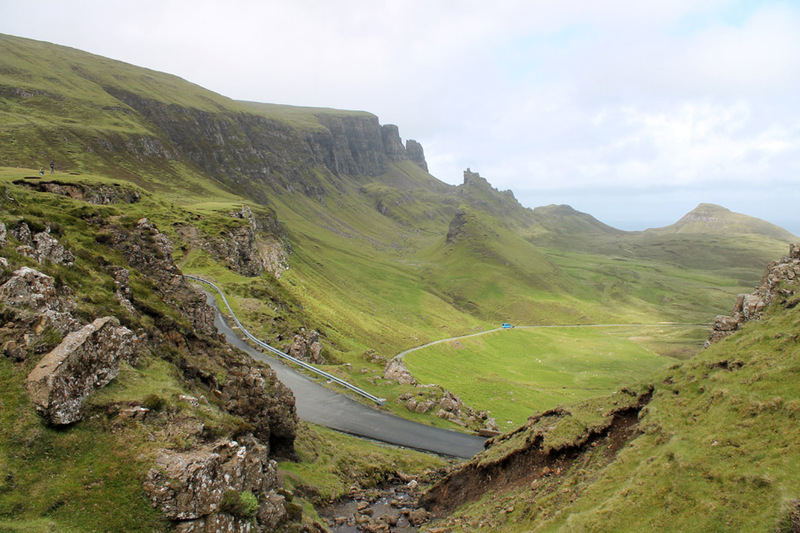 Behind are the dramatic cliffs of the northern end of the Quiraing. The path from here would take us over to The Needle, The Prison and The Table if we continued all the way. The dogs were just happy to be out for a walk. 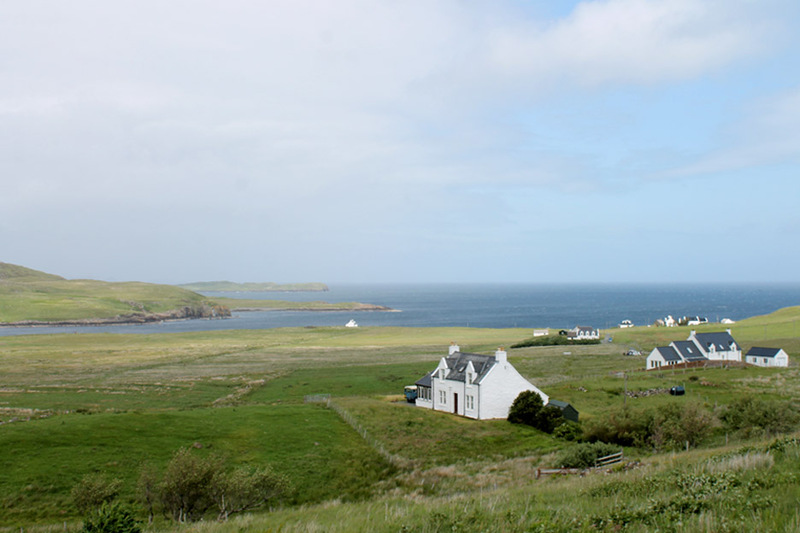 We're in the shadow here but Flodigarry Island is enjoying a large patch of sunshine. A fellow walker ahead . . . he was walking the track and had the advantage of a lift waiting at the other end. surrounded by high ground and therefore no visible river or stream exit for any of the water. A convenient stone allows a stop to take in the atmosphere. Unfortunately that atmosphere was becoming appreciably more moist . . .
. . . to the point of being ridiculous ! 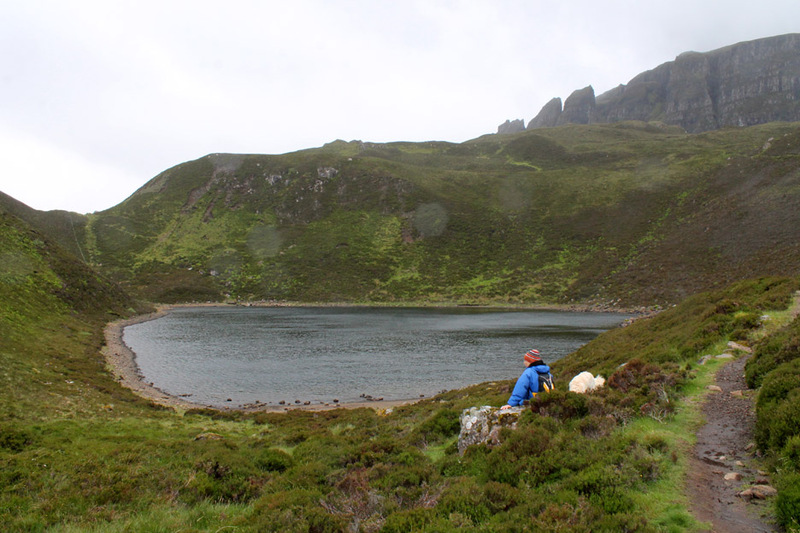 The camera went away as we returned to the car but it came out for a picture of the wind-lashed lochan we had passed at the start of the walk. Half an hour later . . . and four miles further on . . . the world had changed. 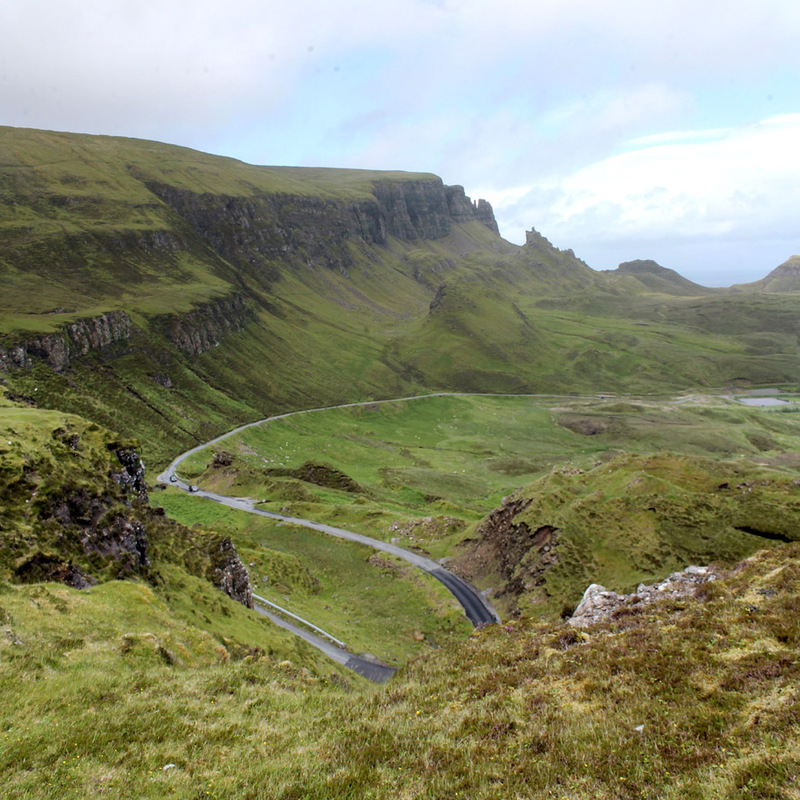 Staffin Island again as we take the Uig mountain road up to the Quiraing. A piece of roadside history . 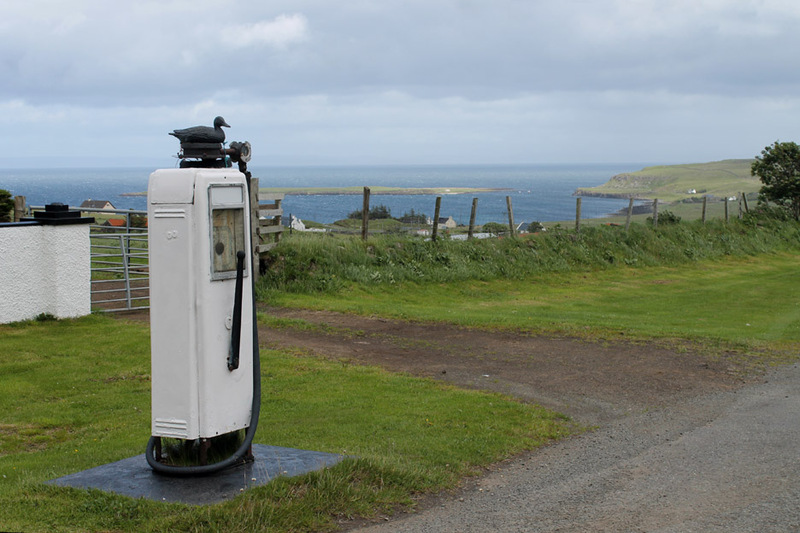 . . a hand-operated roadside petrol pump . . . presumably no longer used. Can't think of a brand name that includes a black duck in the title ! 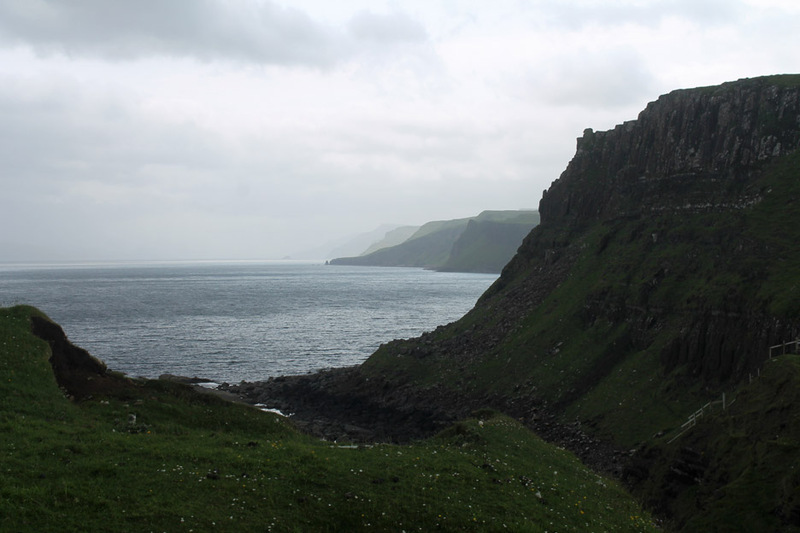 As we approached the escarpment we passed The Cleat and the Druim an Ruma cliffs. 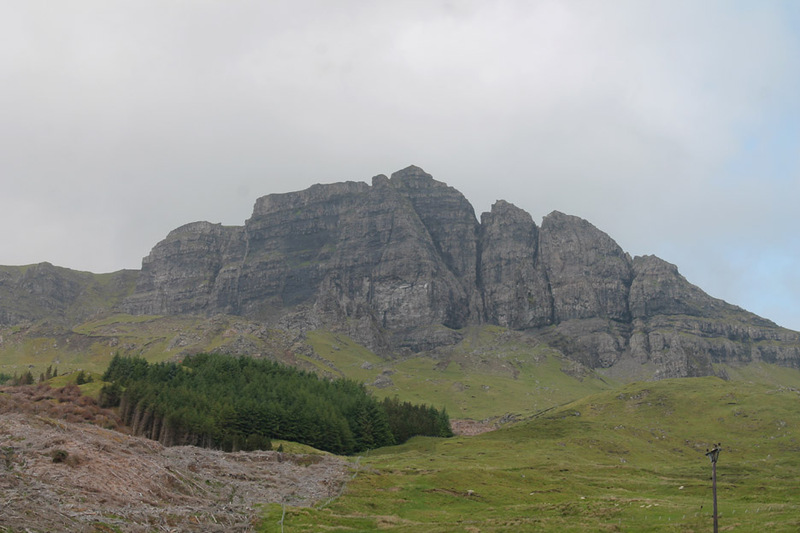 We stopped the car to look at the many and varied rock pinnacles that adorn the escarpment. Suddenly the sky around us vibrated to the sound of large birds. 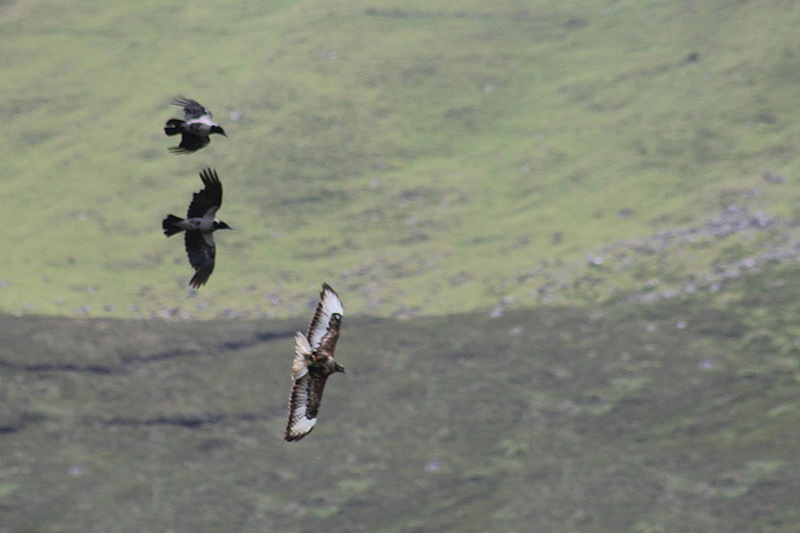 Four or five hooded crows (two pictured here) were harassing a larger buzzard. unflustered by the ground level disturbance . 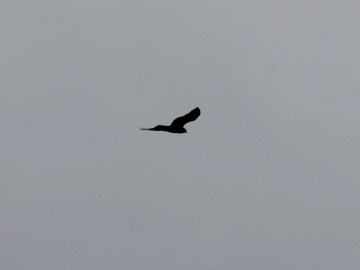 .
. . . a fine Golden Eagle. The last section of the mountain climb becomes quite steep and exposed with a couple of nice hairpin bends. The big picture . . . 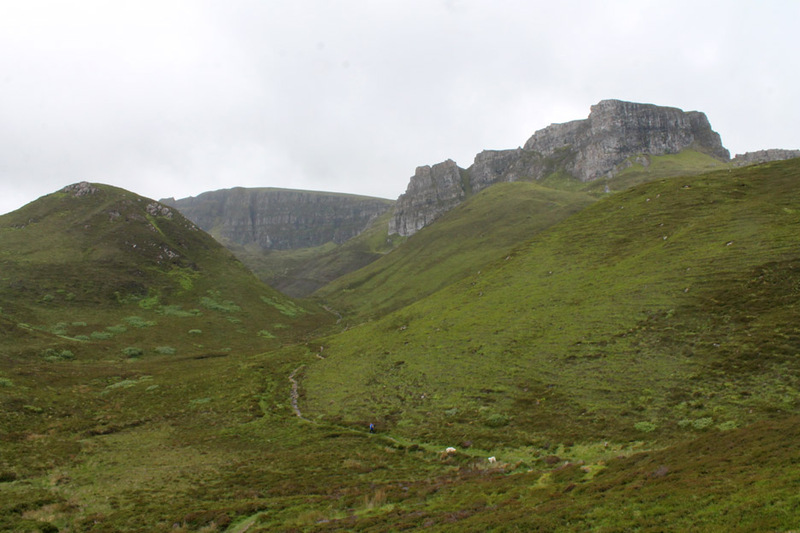 The Quiraing from the start of our moorland climb to the high point of Bioda Buidhe. 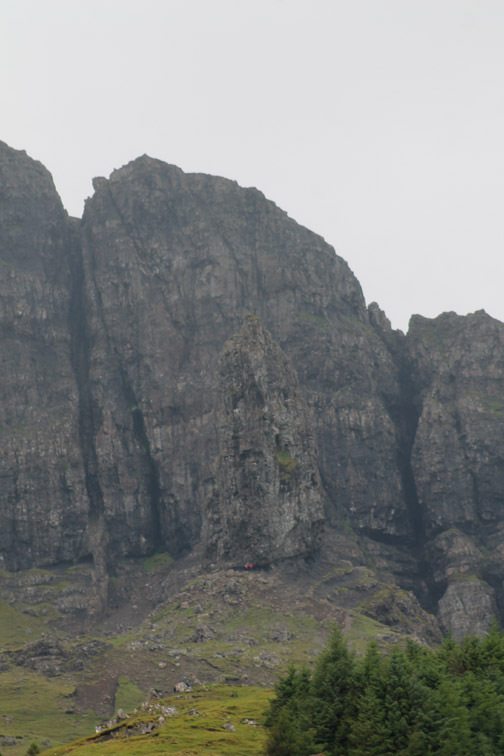 Zooming in on the rock pinnacles. 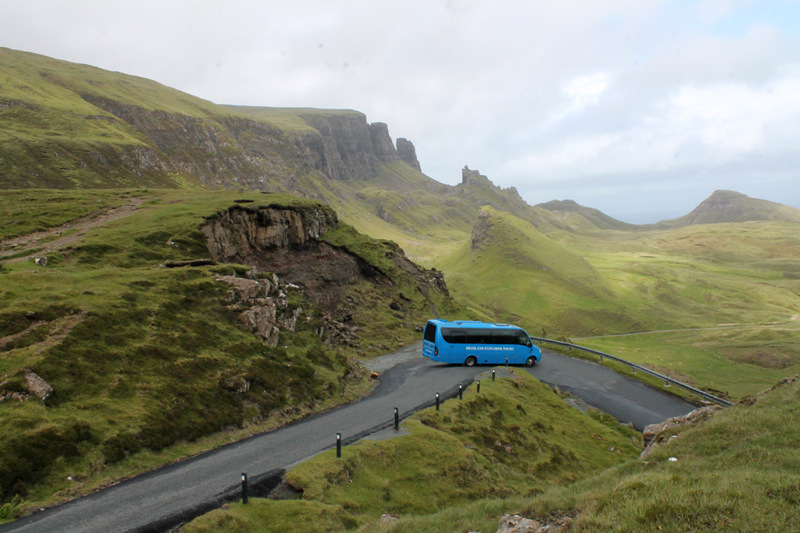 This is a popular places for visitors, including several local coach companies. The big picture . . . now the wide picture. Stunning scenery as that blue minibus reaches the level ground beneath the hill. 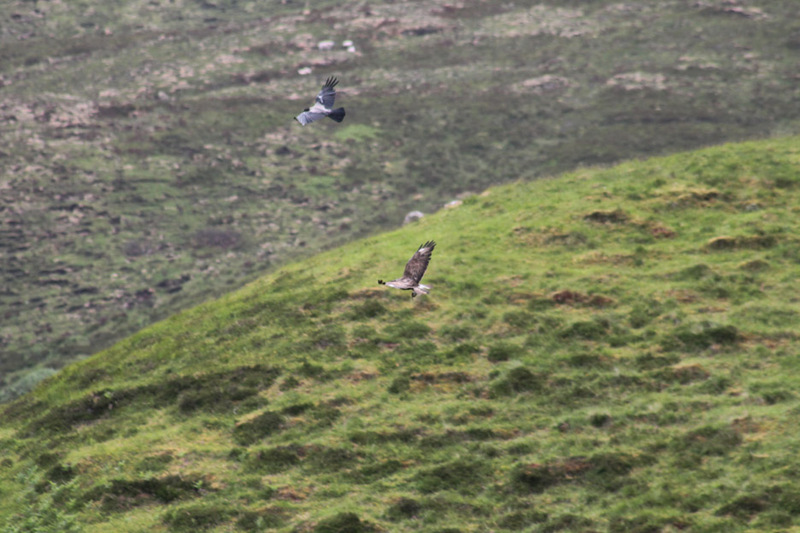 A 'have-a-look-while-we-are-here' moment which turned out to be an interesting stroll . 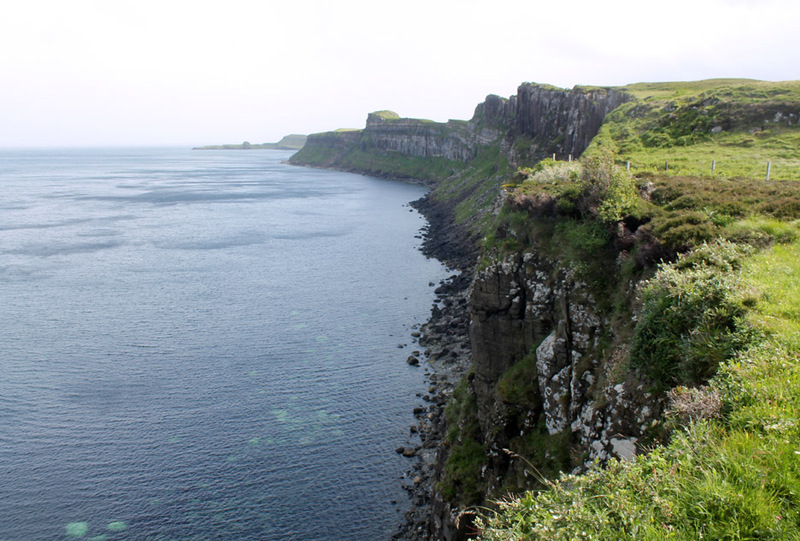 . . Staffin Island close up. 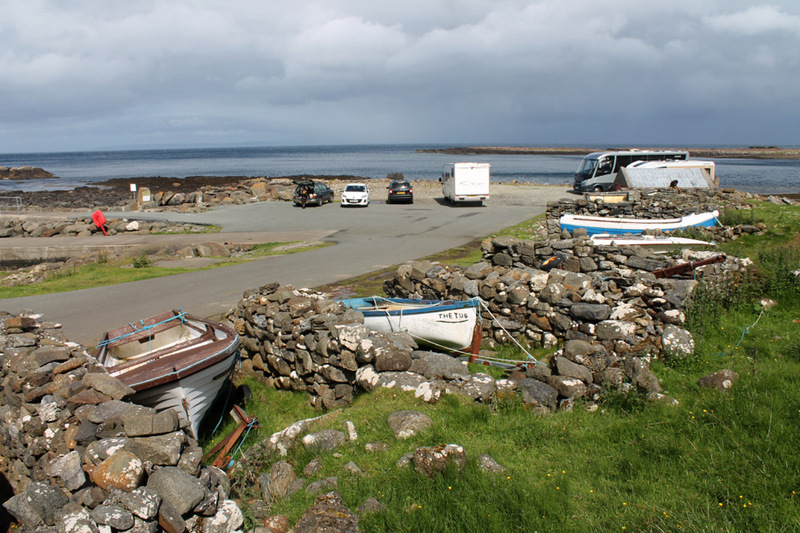 We turned off at Stenscholl and took the short coastal road below the village. 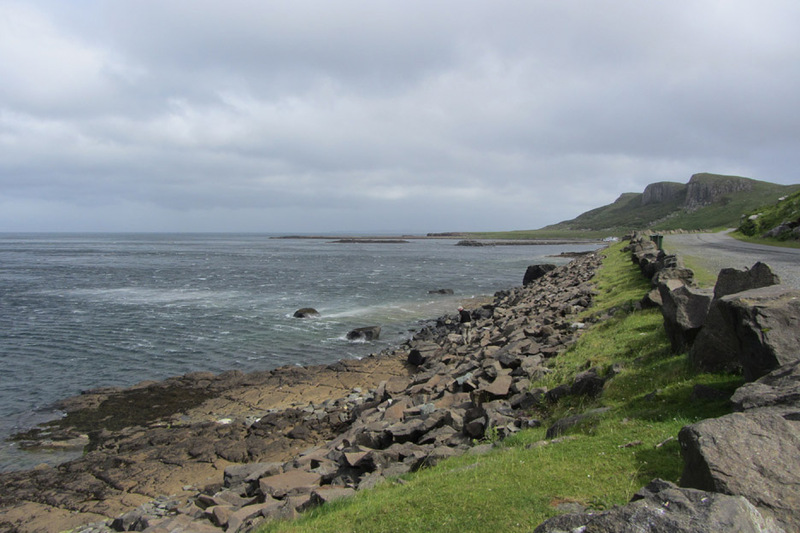 A very strong wind as we drove round to Staffin Pier. The Tub and several other boats . 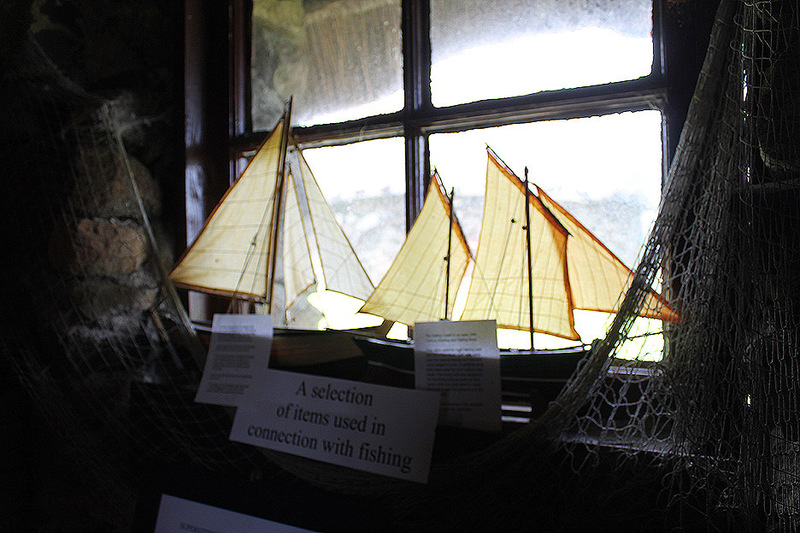 . . harboured between walls presumably to protect them from the extremes of the weather. 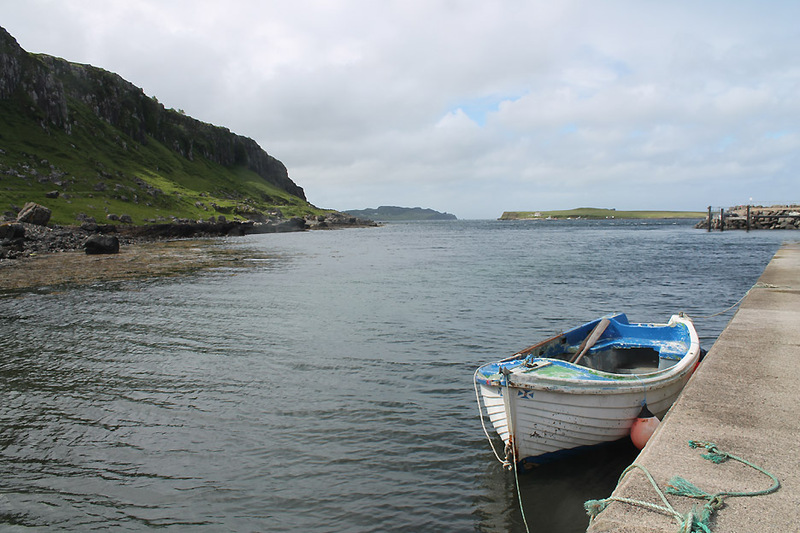 In the lee of the headland and the island, Staffin harbour offers a stretch of safe mooring and a modern pier. 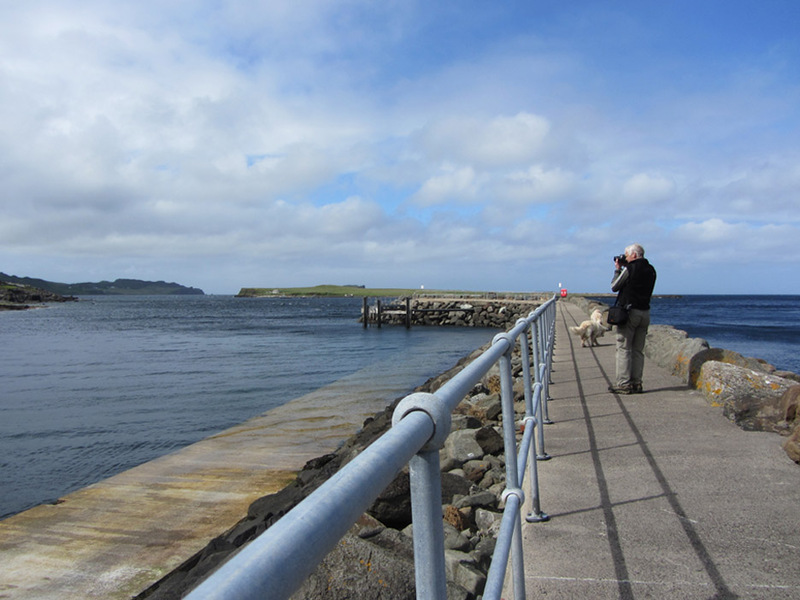 Myself, fleece clad against the cool breeze, walking out along the jetty. 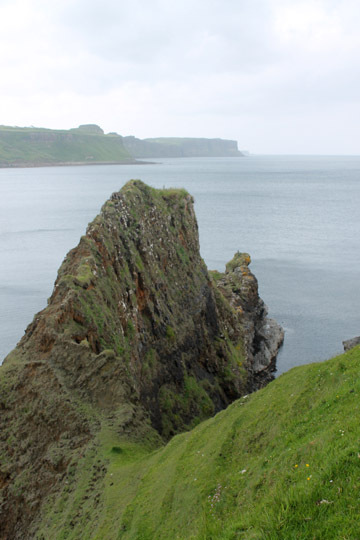 This are is famous for the geological history . 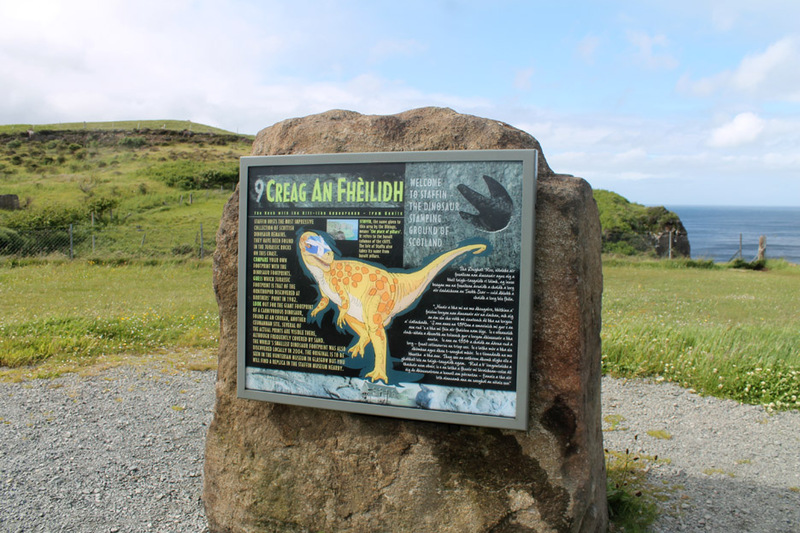 . . which here features the age of dinosaurs. 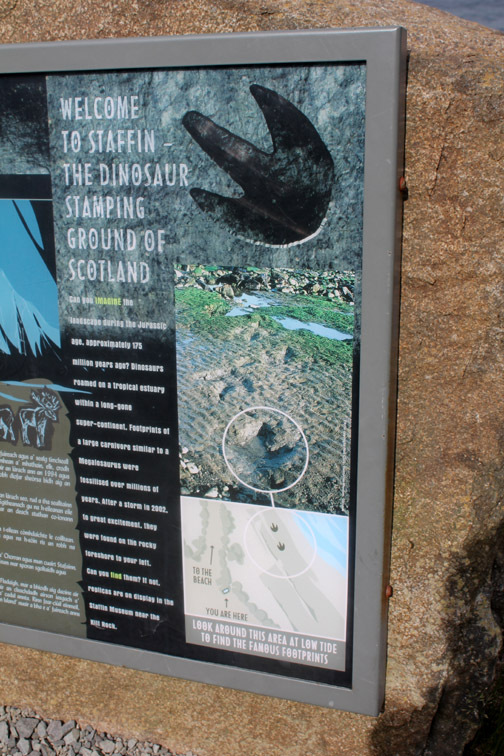 These ancient creatures used to roam on the alluvial soils of the area and some left footprints that are still recorded in the geology of the rocks to this day. until a catastrophic extinction event (following a meteor strike) which occurred approximately 65.5 million years ago. On the headland near the pier is a signboard . . .
. . . we tried to match the dots but didn't get too far. 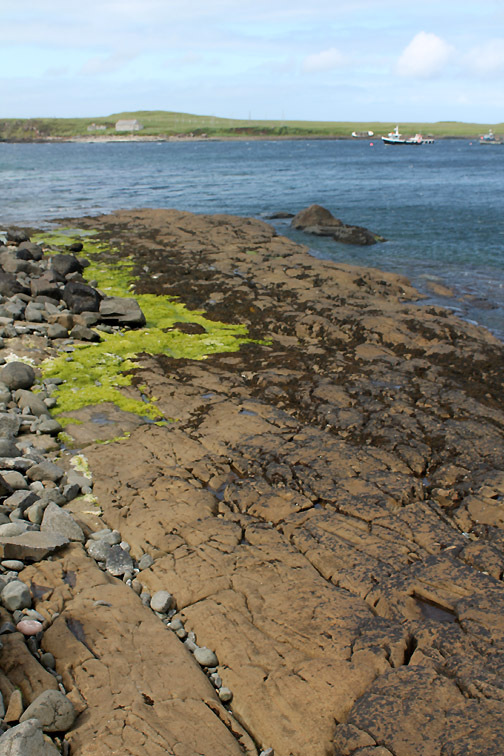 Perhaps it would have been better with the tide further out and more rock exposed. in a very colourful way. 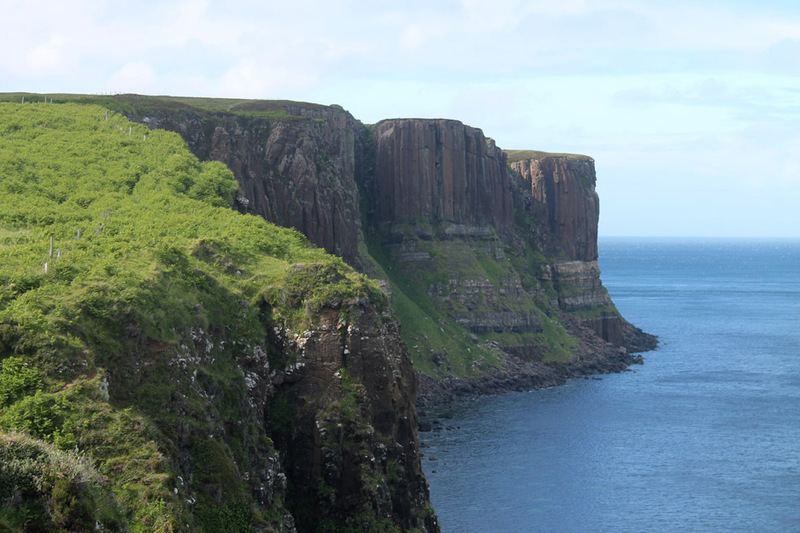 This headland goes by the local name of Kilt Rock . . . after the tartan appearance of the coloured bands. 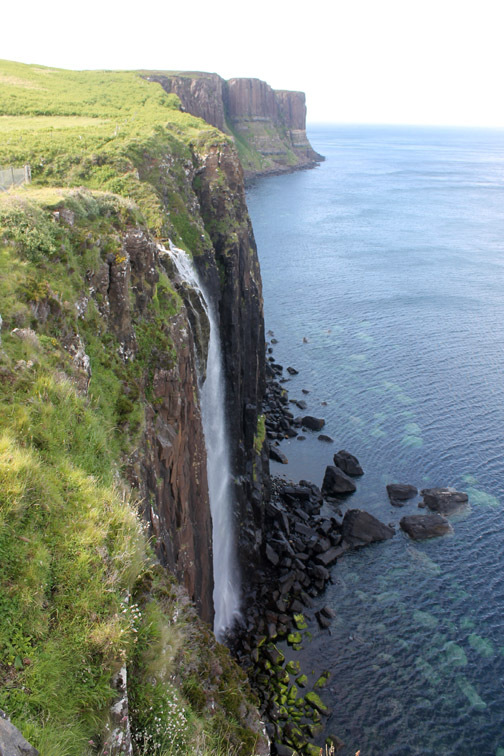 The cliffs drop straight down to the sea . . .
. . . the waters of Loch Mealt forming a fine waterfall. 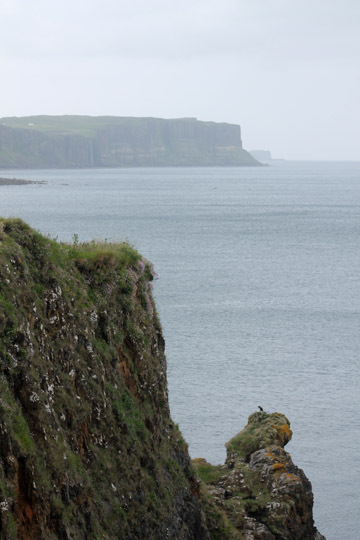 Looking south along the cliff edge to the distant headland of Brothers Point.
" The Brother's Point "
the base of the walls reflecting the original stone construction, the upper story and roof reflecting a decidedly more modern appearance. 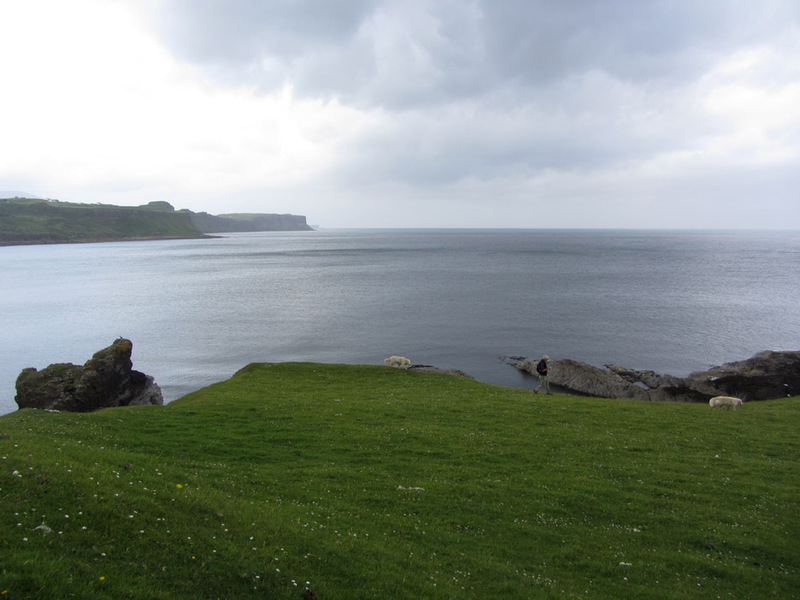 The track leads down to Culnacnoc Bay. 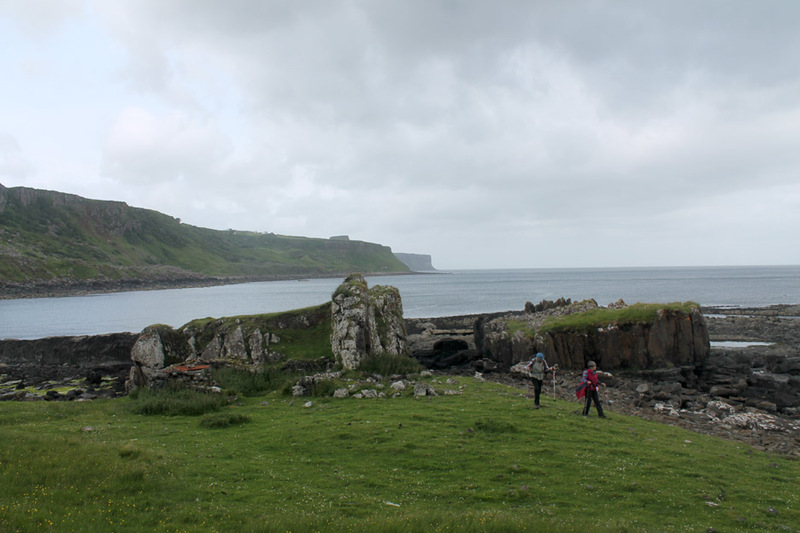 All that remains of an ancient settlement that once took advantage of the sheltered location. Down at the head of the beach looking north to Kilt Rock in the far distance. What a nice sentiment . . . informative without being authoritarian or sensationalist.
" 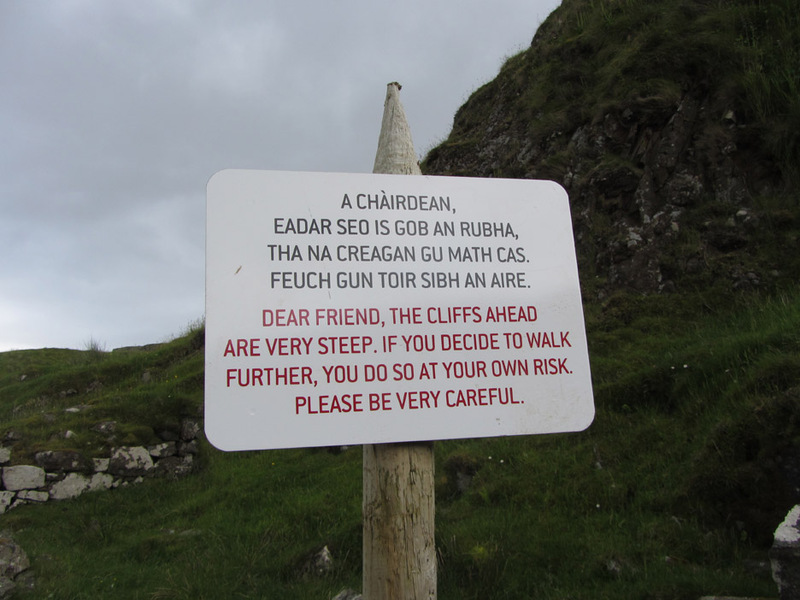 The cliffs ahead are very steep . 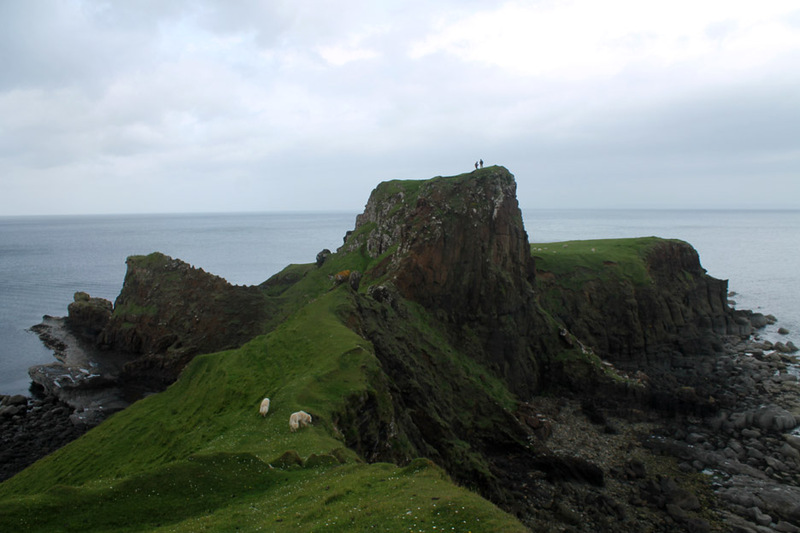 . . "
There is evidence of an ancient hill fort on the top of the headland where the two people are standing. 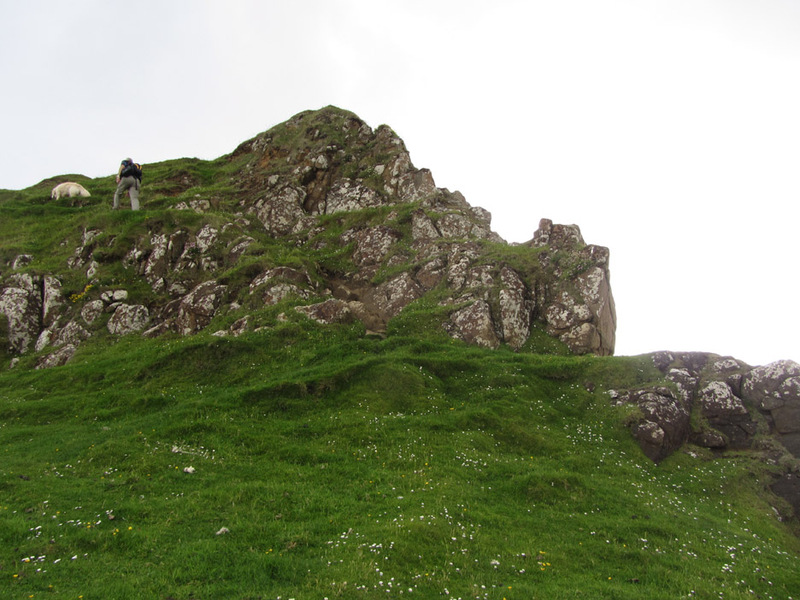 A great defensive position as it is a tricky climb to the top. The old fortress has a good view south down the coast too. evidence it seems of the time when Monks had their monastic cells here . 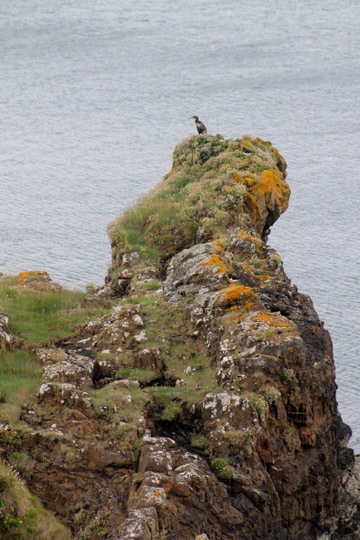 . . hence the Headland of the Brothers. 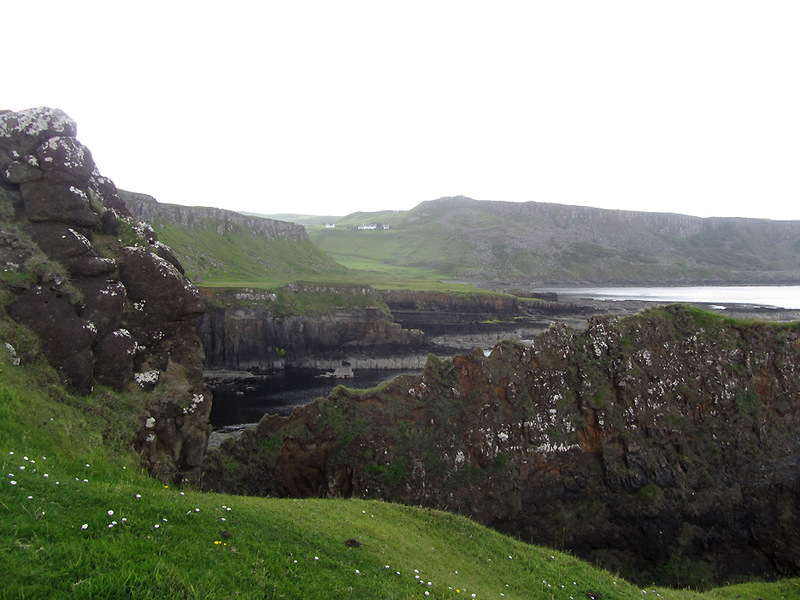 Fine geology here including this craggy volcanic intrusion heading out to sea. From the top . . .
closer in . . .
. . . and even more so. 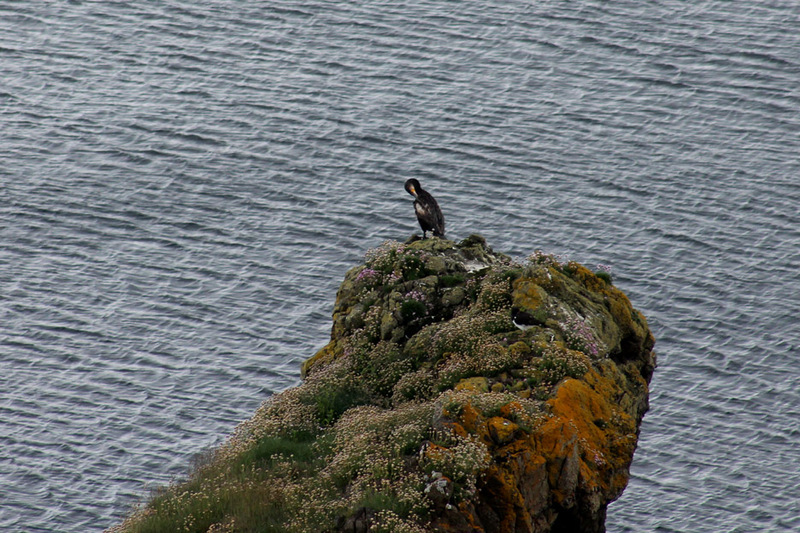 With the bigger lens on we could make out the detail of the flowers and of the Shag preening itself on the end rock. That southern view as we make our way back . . . now it is looking a little more grey than it did earlier. 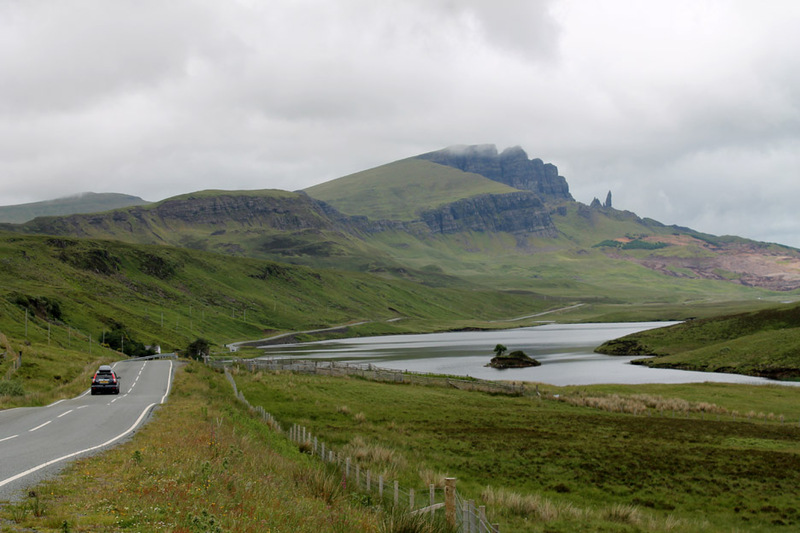 Back on the road to Portree . . . the reason for the greyness becomes obvious as we pass through a shower of rain. 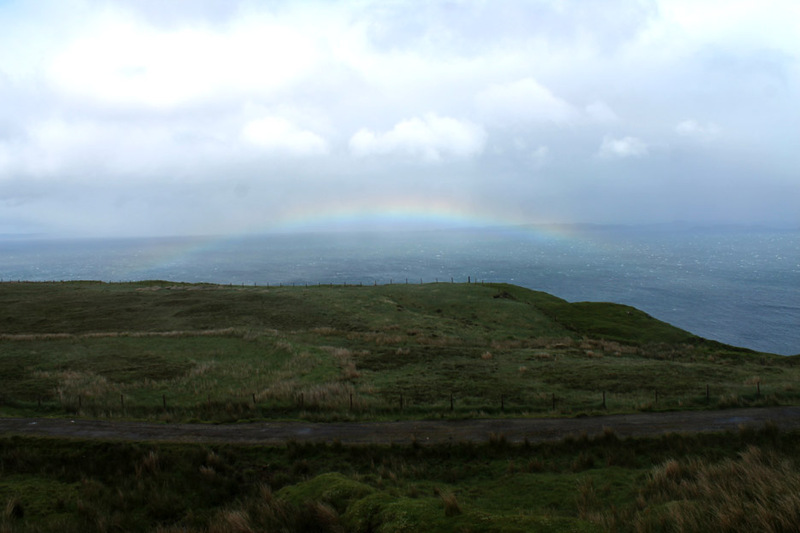 Sunshine and rain of course can often lead to a rainbow . . . as it did today. 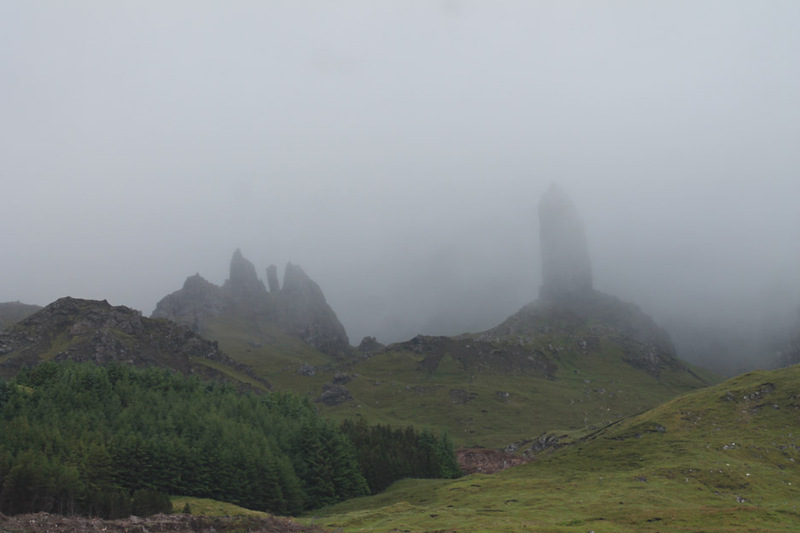 The Old Man of Storr as we drove back. 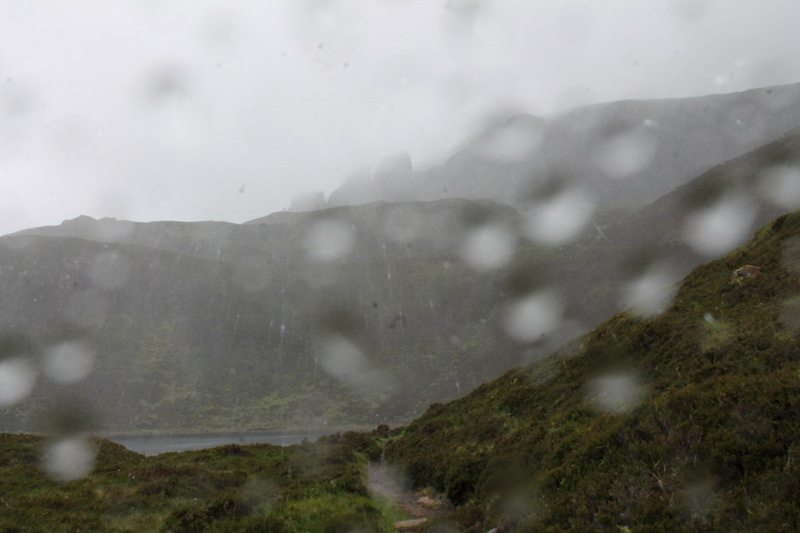 That rain shower has resulted in a lowering of the cloud base and the rock pinnacle is only just visible. 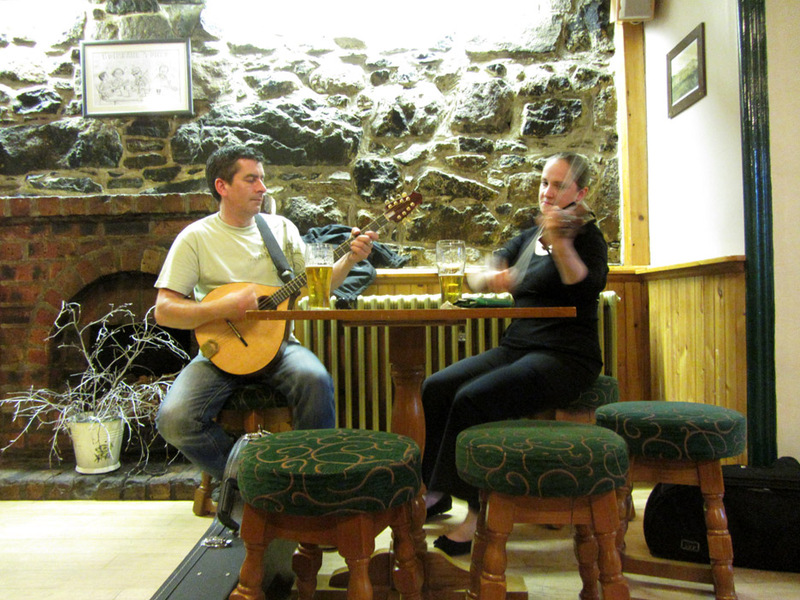 In the evenings we enjoyed a meal out on Portree and then went in search of a little local live music at the village of Edinbane. Annabel and Seamus, hotel proprietor and one of her colleagues, were rather good at creating just that. Click to start the three minute video . . . and then sit back and enjoy the music. Tomorrow will be our last full day of the holiday . . . so we better get back for a little sleep. 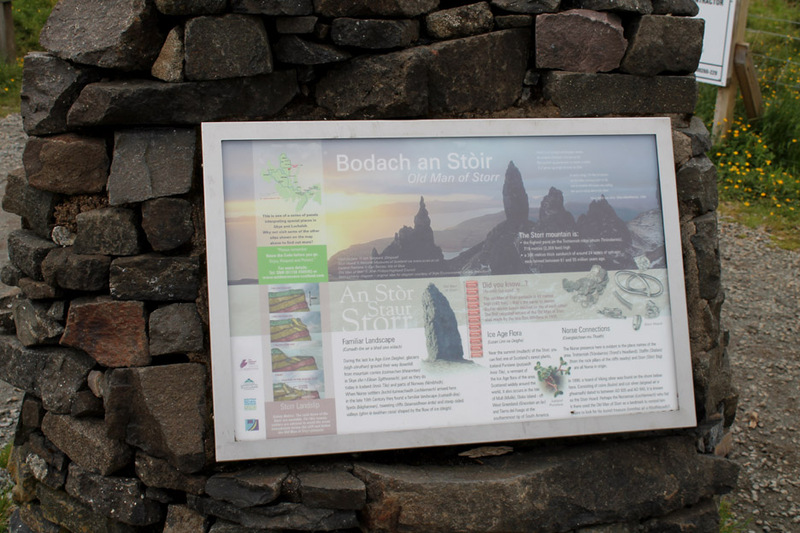 This site best viewed with . . . . a little local information and a map to get you round.